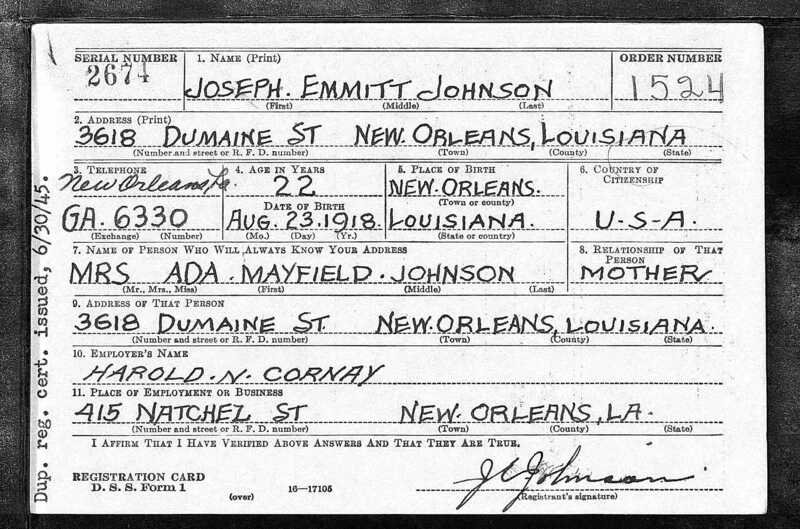 Joseph "Emmitt" Johnson, Jr., son of Joseph Emmitt Johnson, Sr. and Ada Mayfield, was born August 23, 1918 in New Orleans, LA. 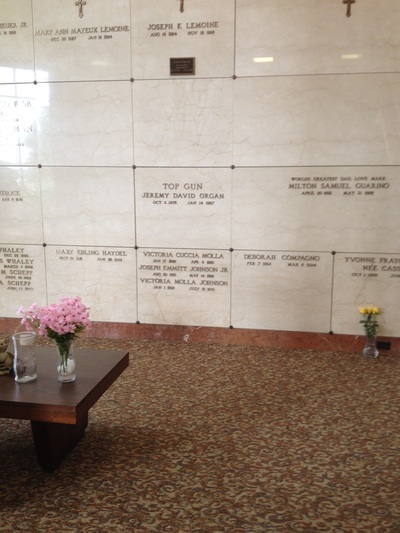 He died on May 14, 1999 (age 80) in Jefferson, LA. 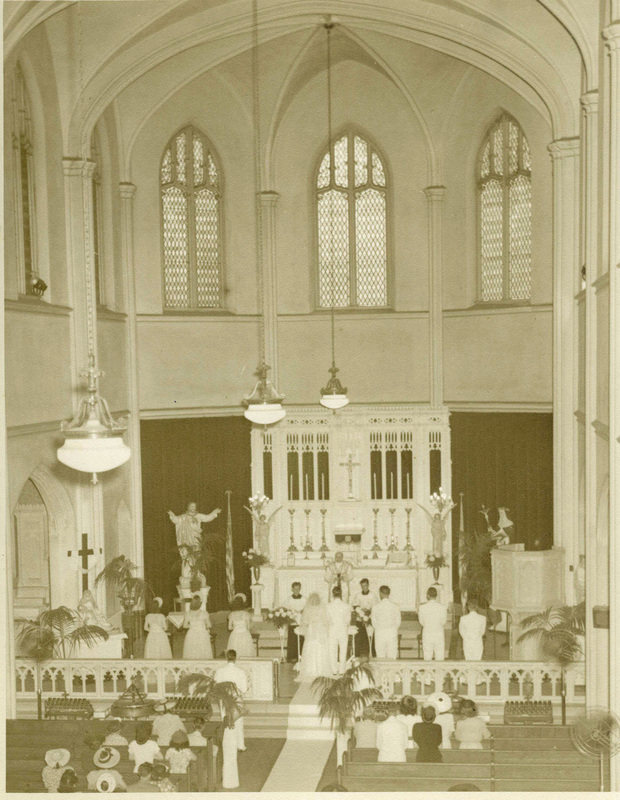 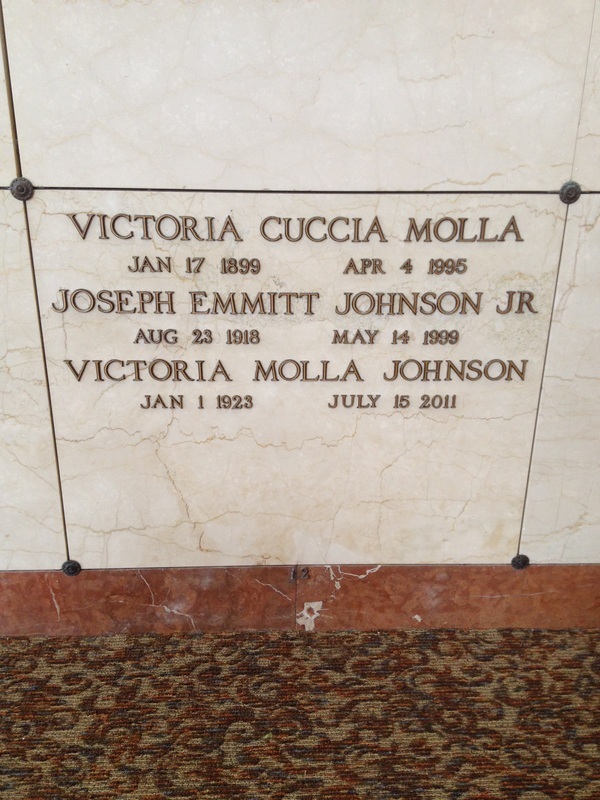 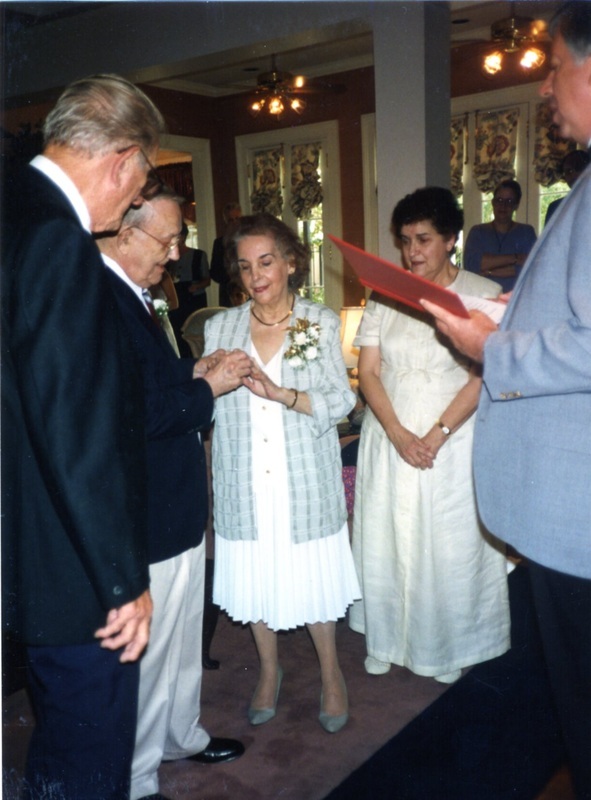 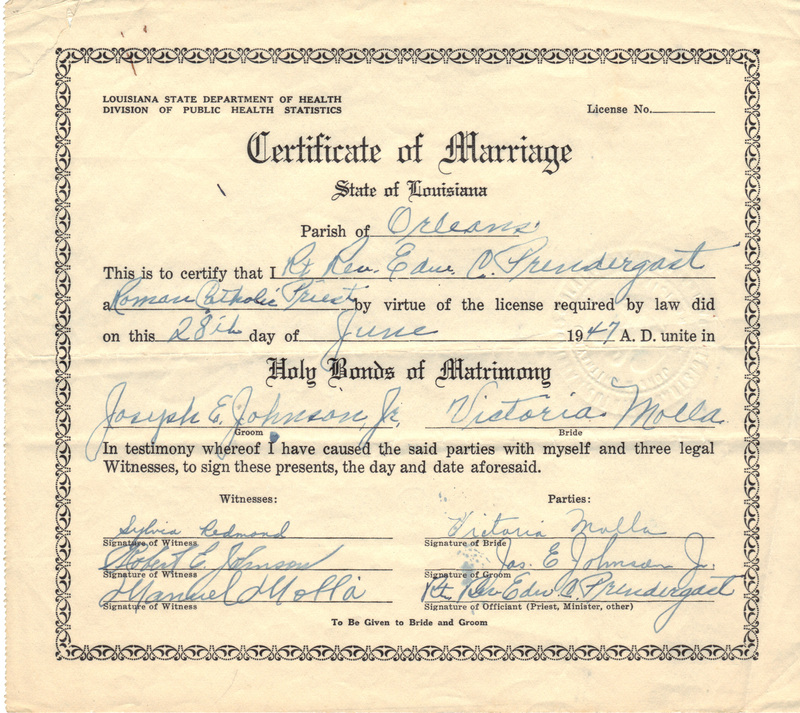 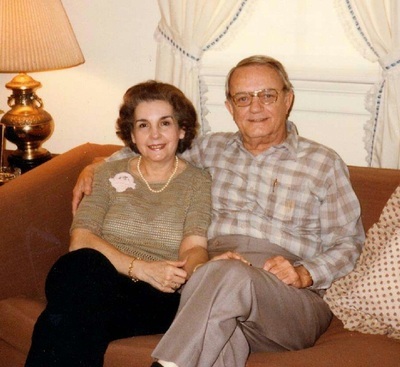 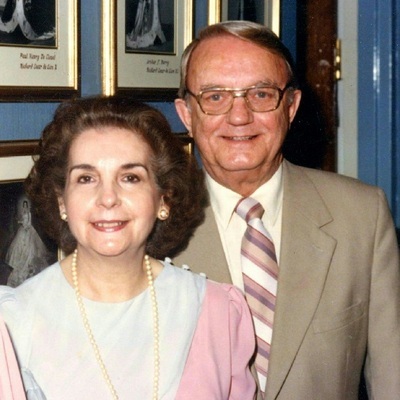 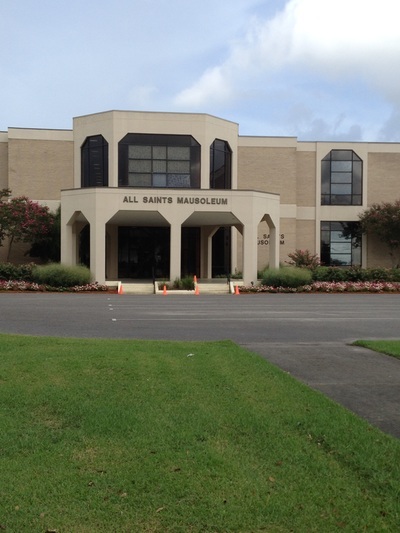 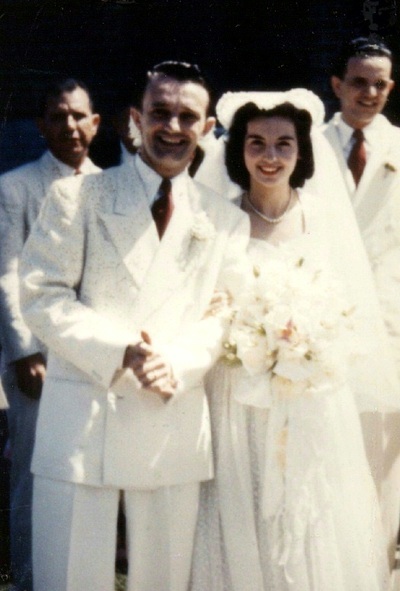 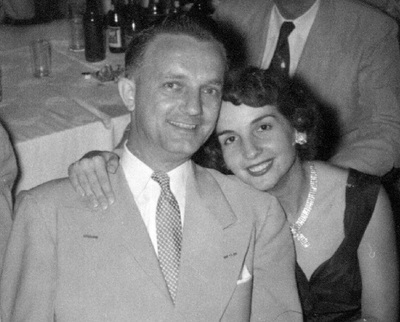 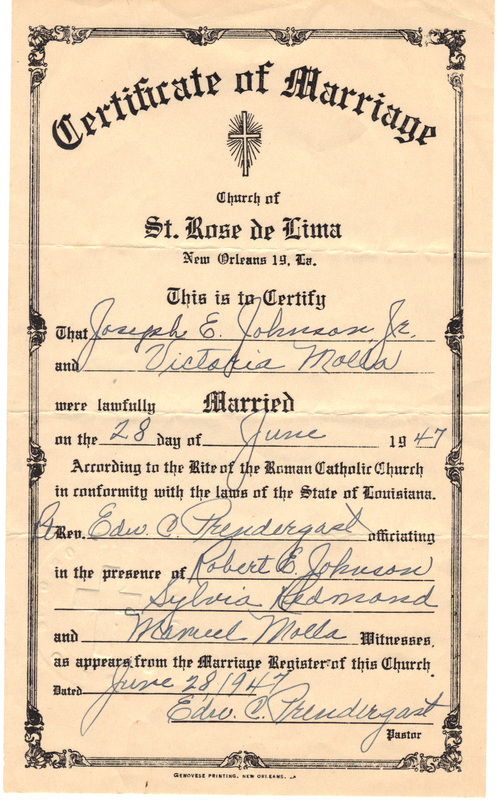 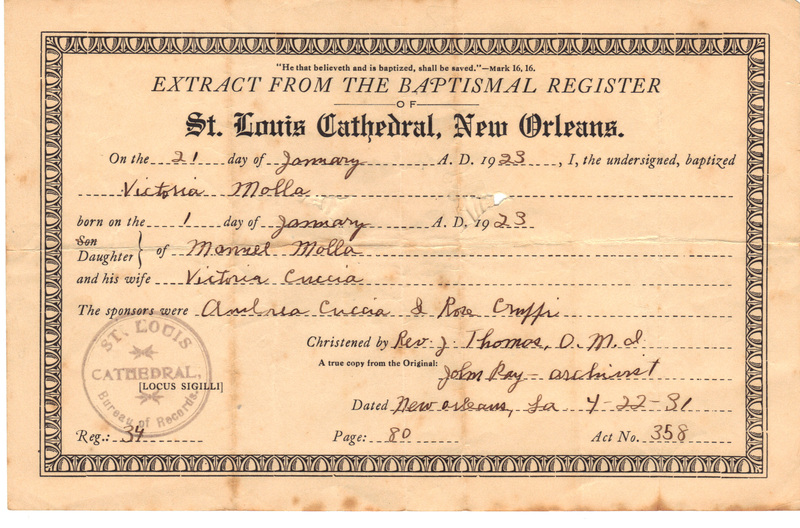 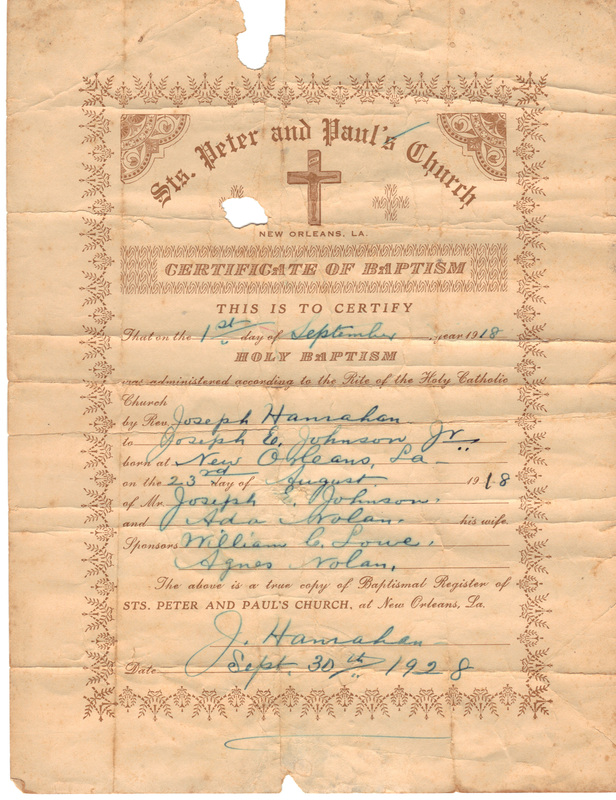 He married Victoria ("Vickie") Molla, daughter of Manuel Molla and Victoria Cuccia, on June 28, 1947 at St Rose de Lima Church in New Orleans. 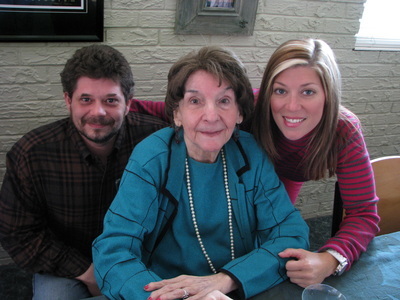 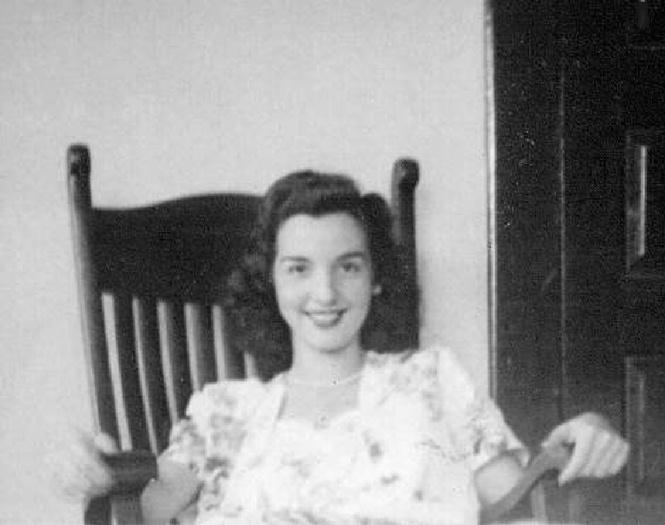 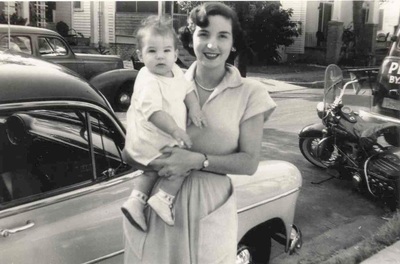 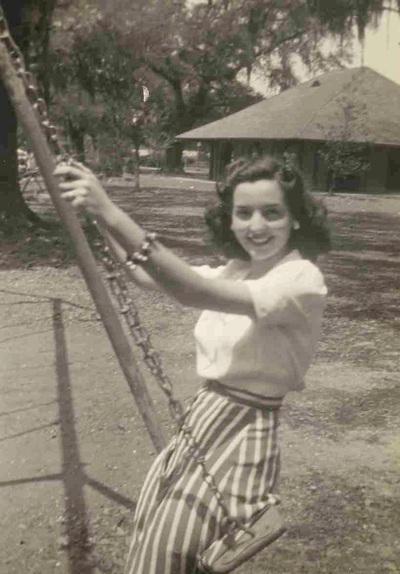 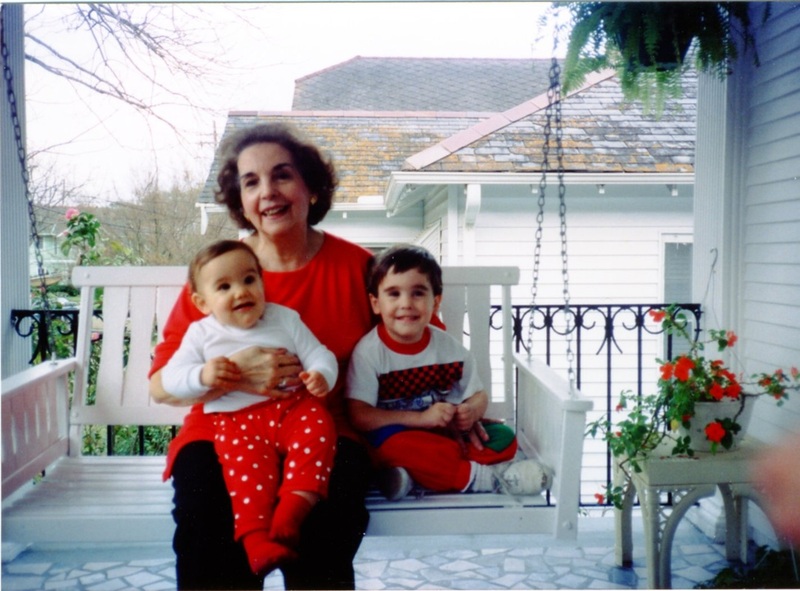 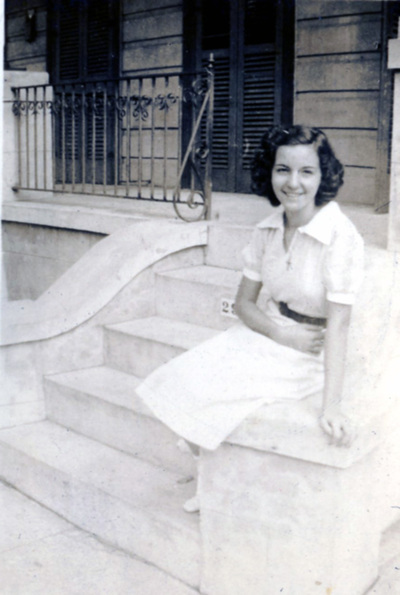 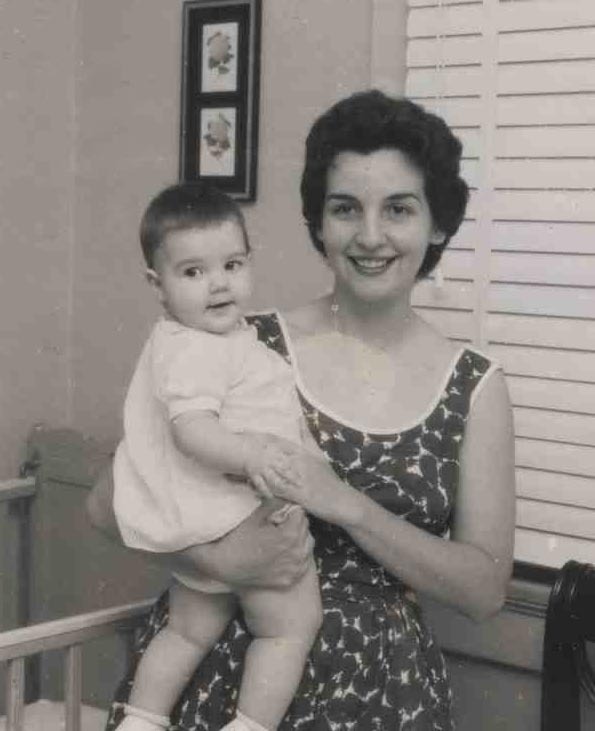 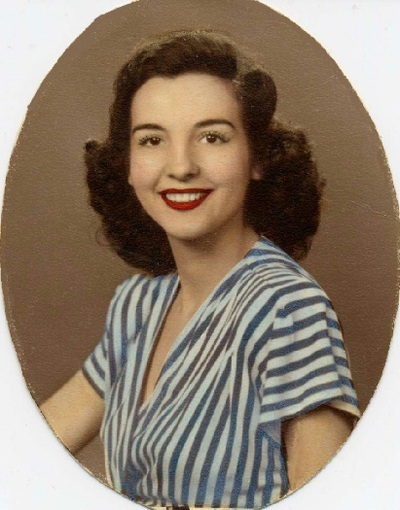 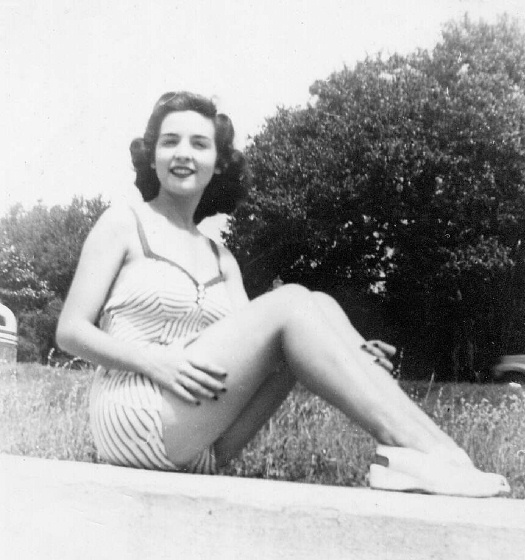 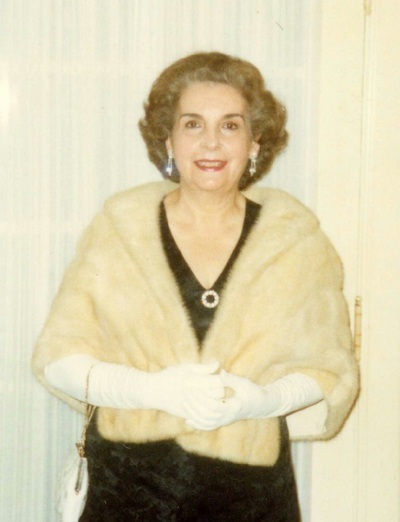 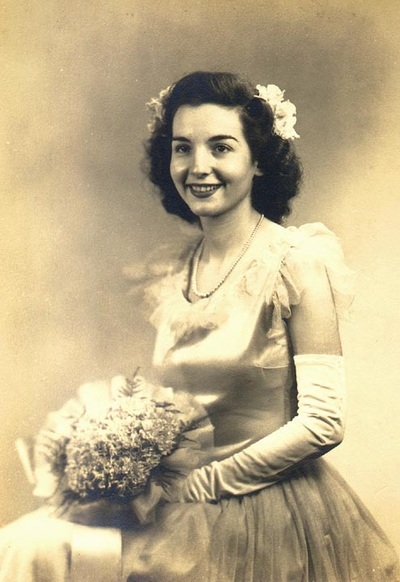 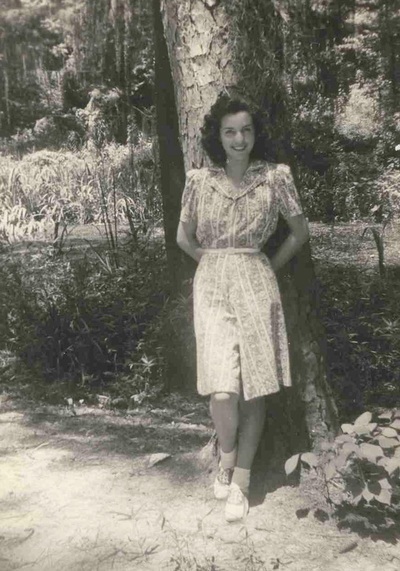 Vickie was born on January 1, 1923 in New Orleans and died July 15, 2011 (age 88) in Metairie, LA. 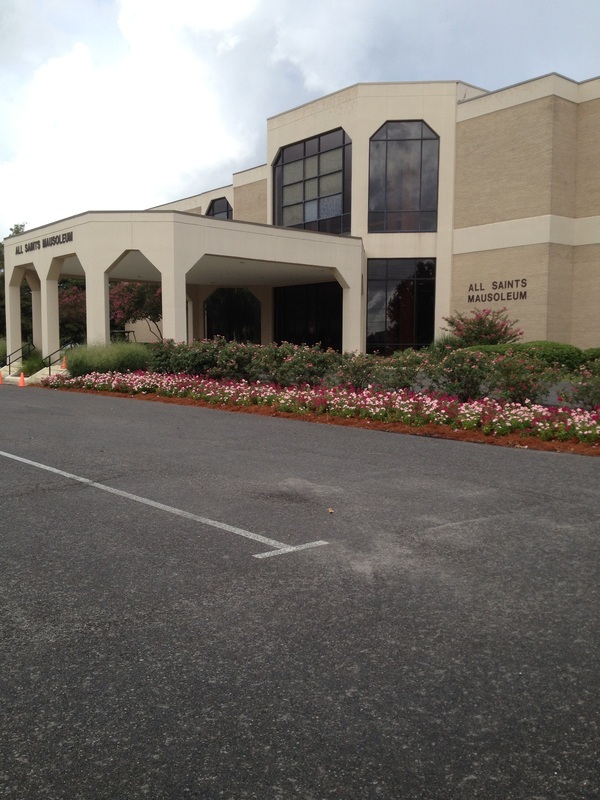 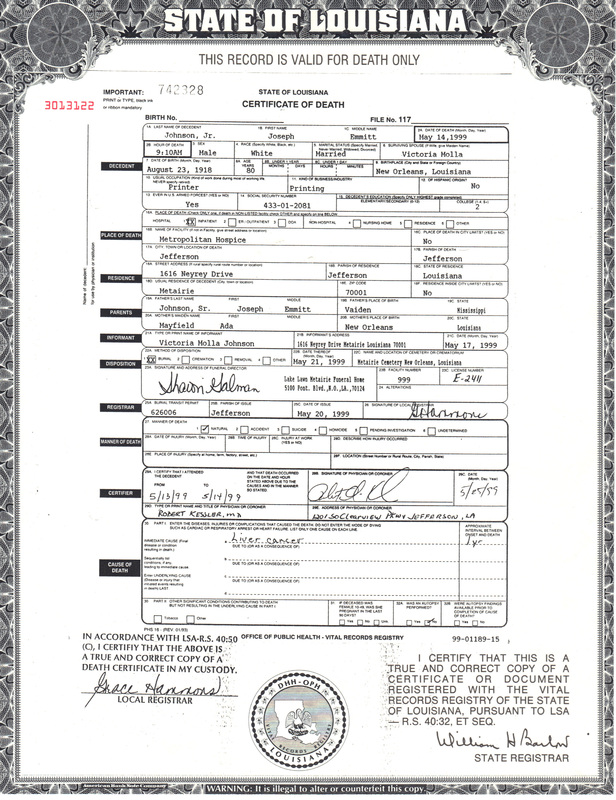 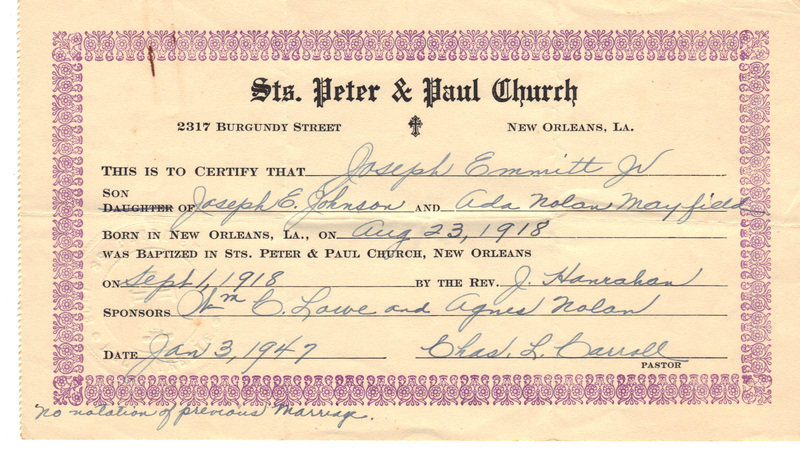 For additional information on the descendants of Emmitt and Vickie, click here. 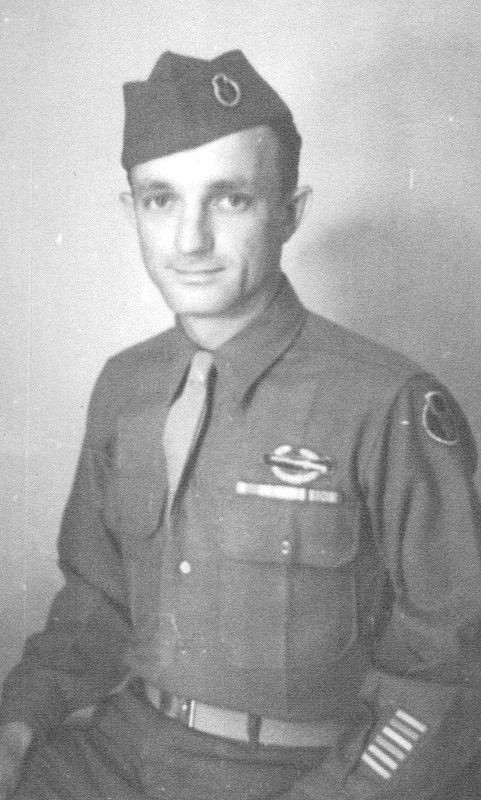 ﻿Emmitt was an Army veteran of WWII and served in the 135th Infantry (Red Bull Division) which fought in North Africa and Italy. 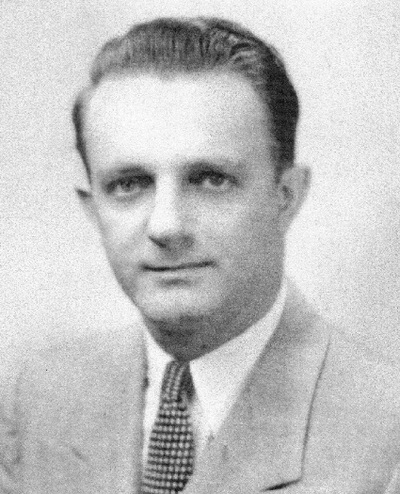 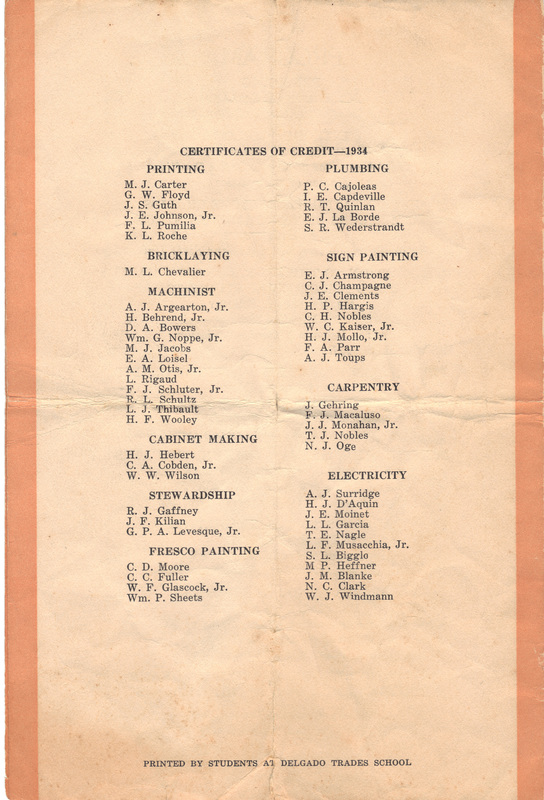 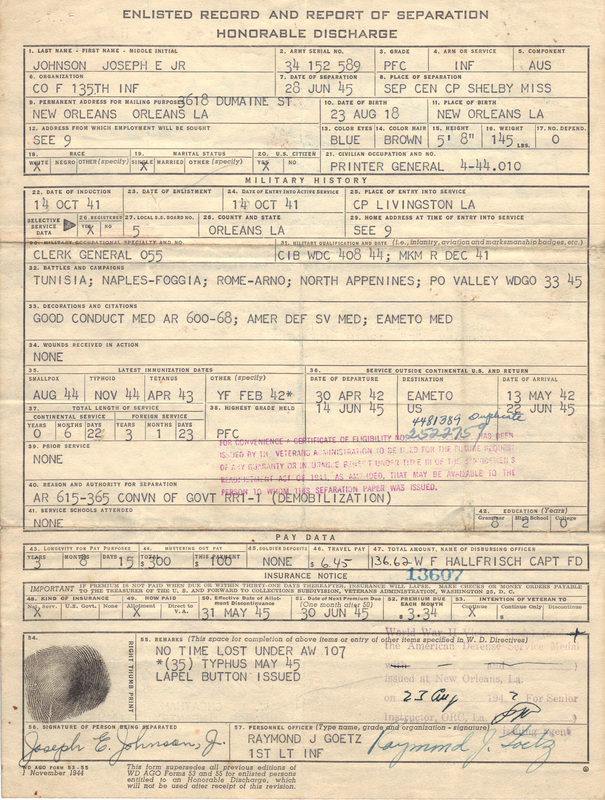 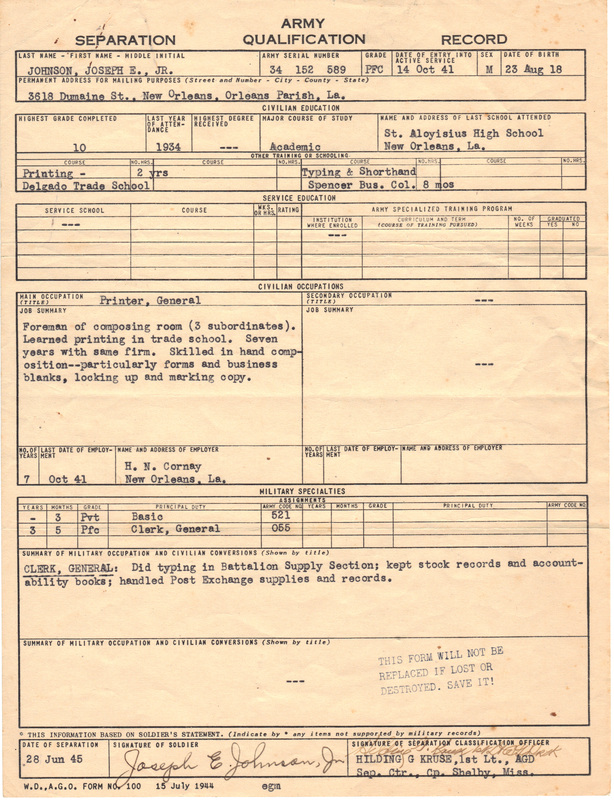 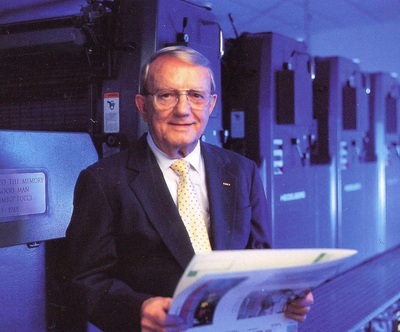 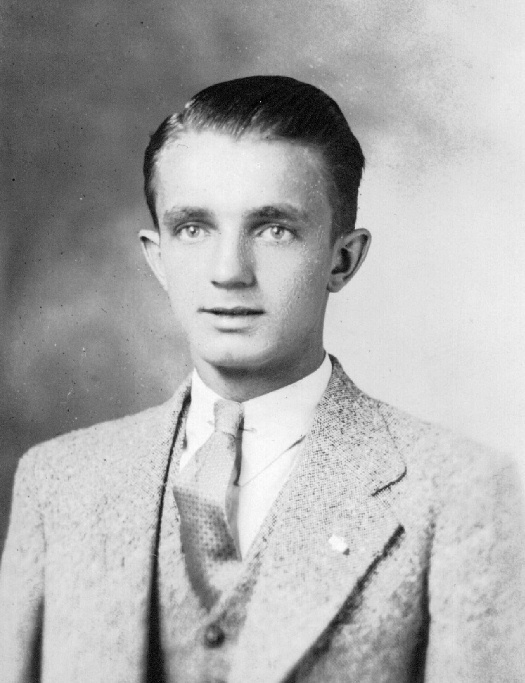 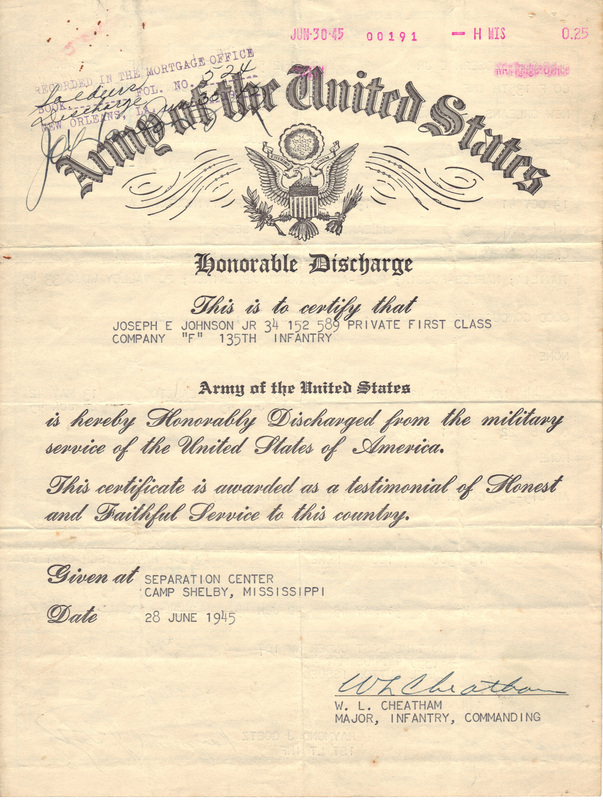 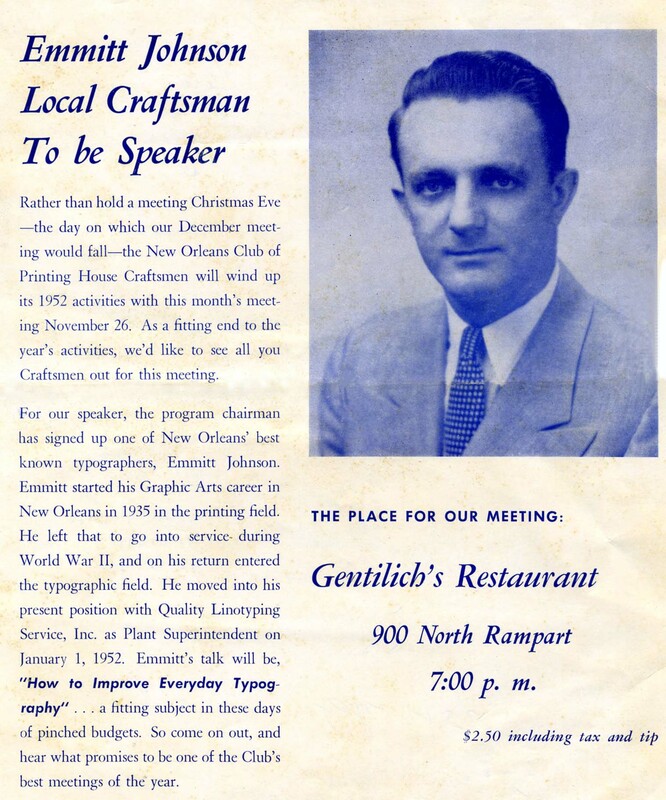 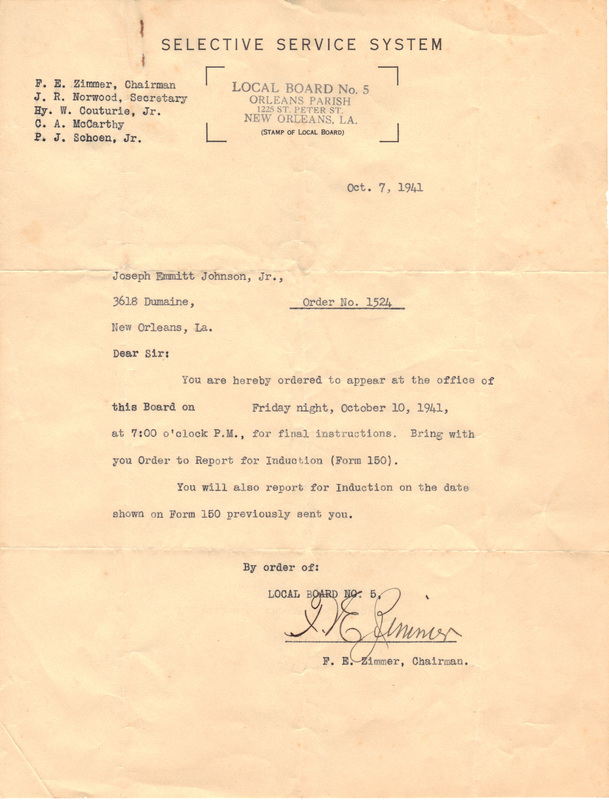 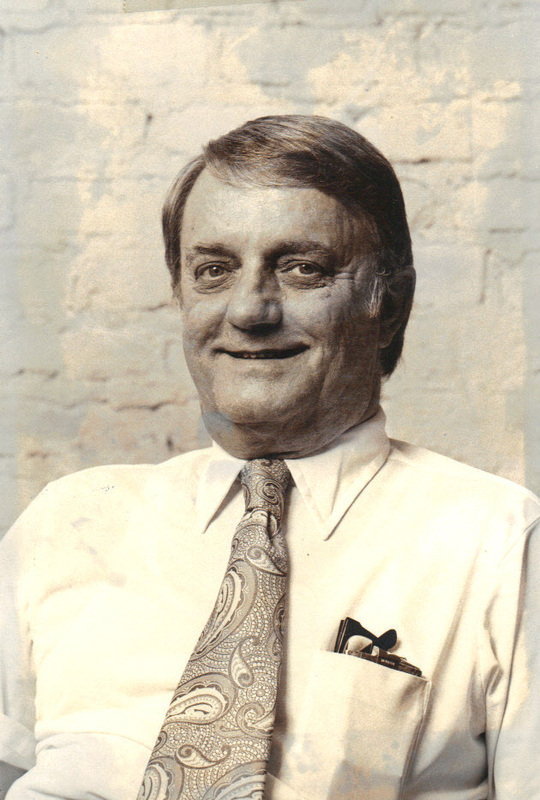 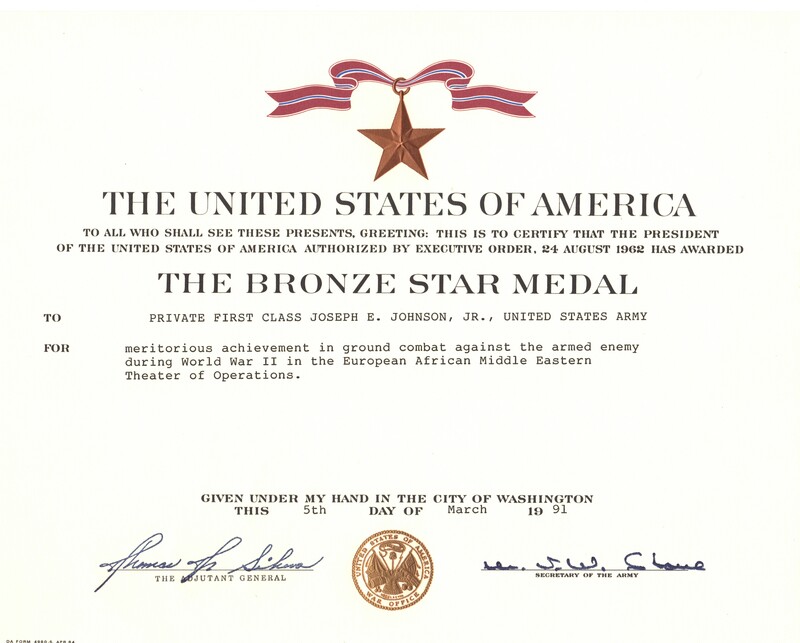 He was awarded the Bronze Star and the Silver Service Star.﻿ A 1934 graduate of the Delgado Central Trade School in Printing, Emmitt enjoyed a lifelong career in the printing industry, with positions ranging from typographer to sales to management. 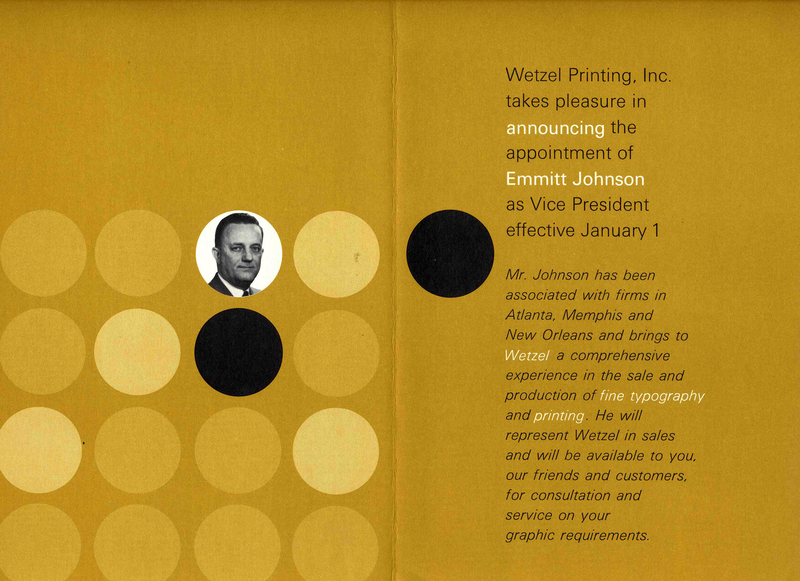 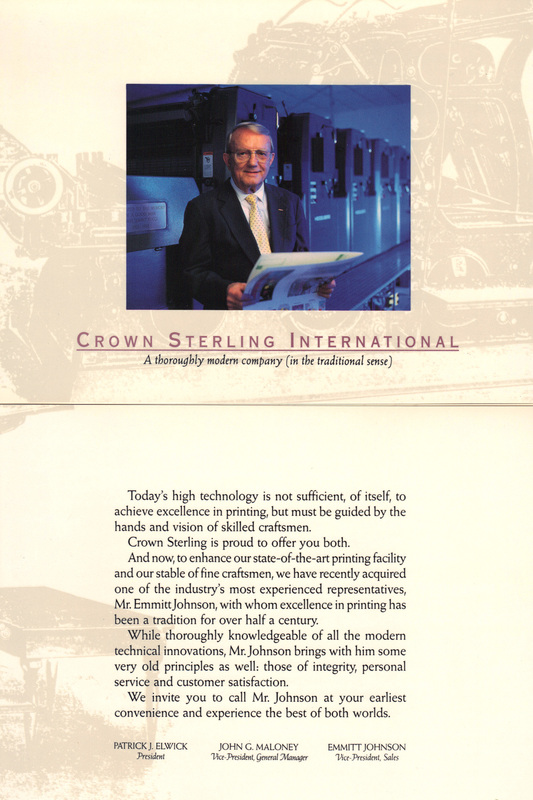 He received a Silver Medal from the Advertising Club of New Orleans. 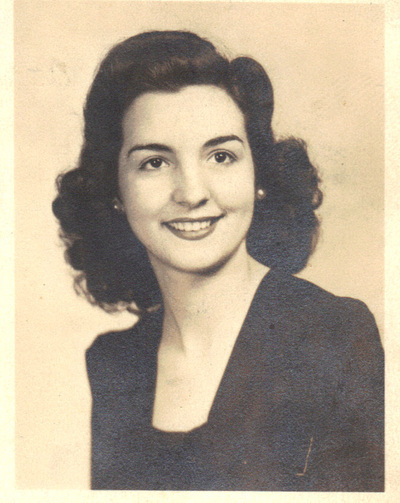 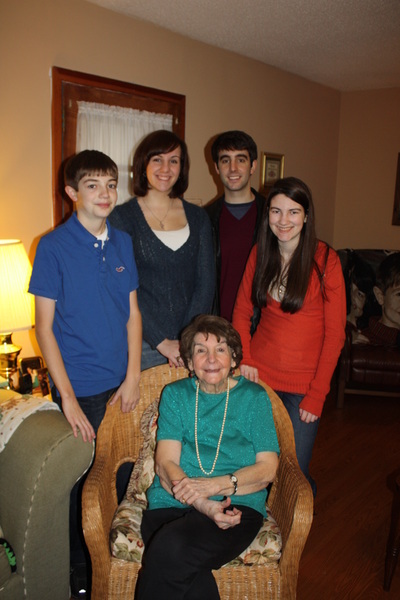 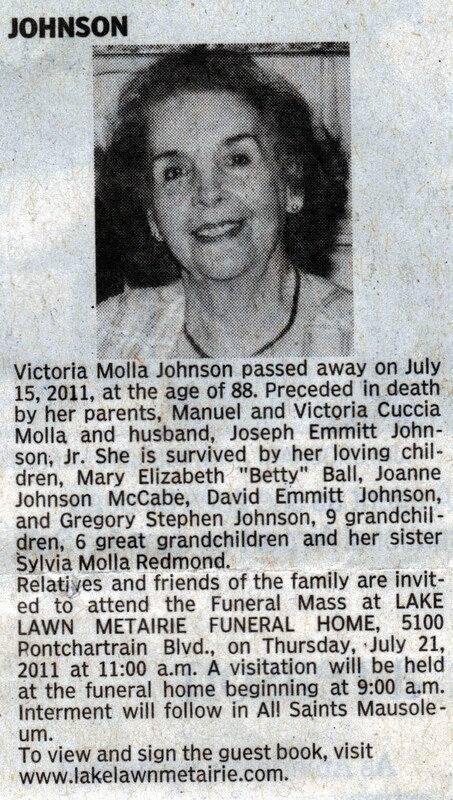 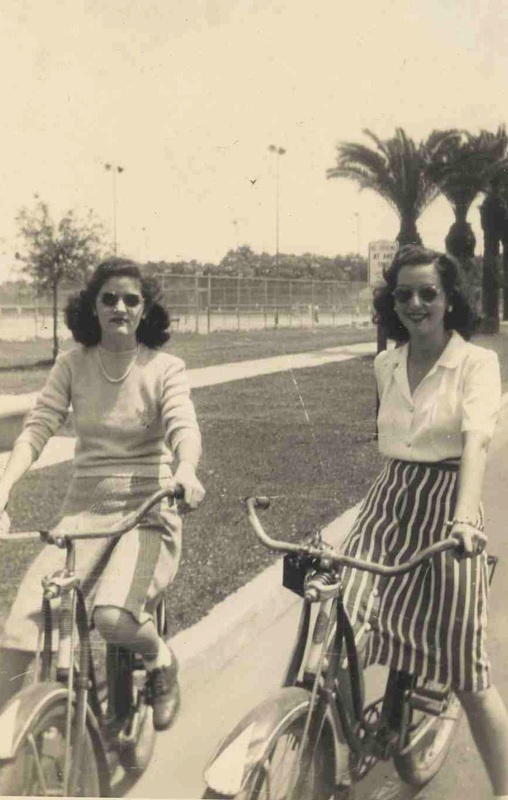 Vickie was a 1938 graduate of John McDonogh High School and worked as a Legal Secretary at different times in her life. 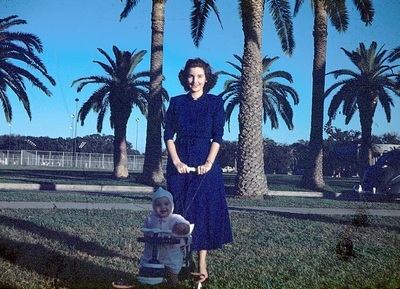 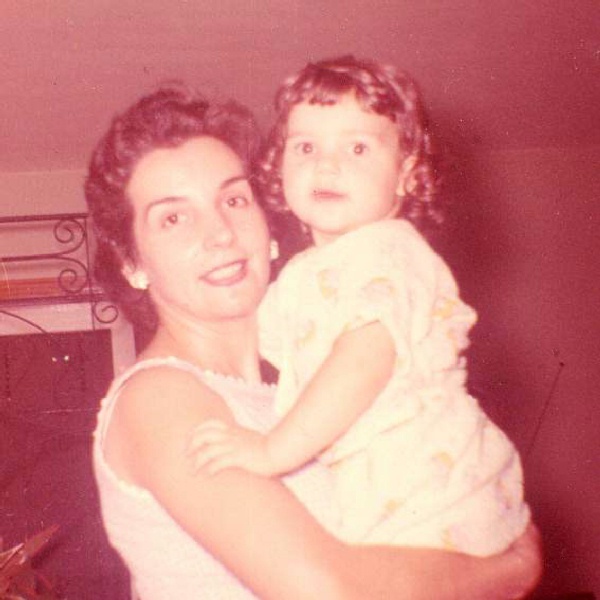 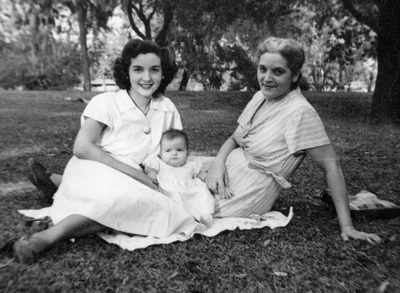 Her most cherished profession, however, was that of wife, mother and grandmother. 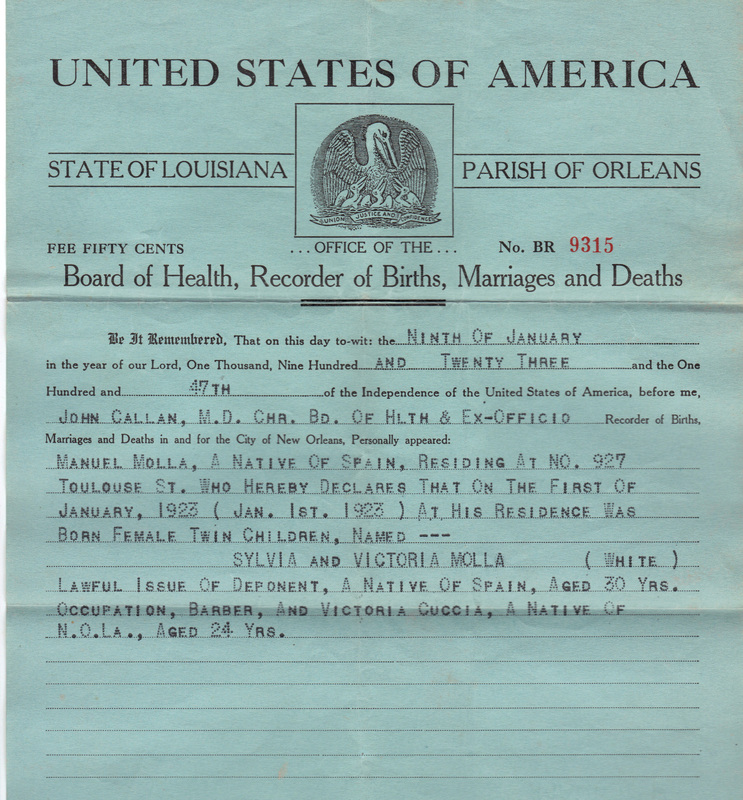 1920 Orleans Parish Census - Emmitt is living at 1231 Dorgenois Street with parents, Joseph Sr. & Ada, grandmother Mrs Charles Engler, and siblings Esther, Charles, Elizabeth. 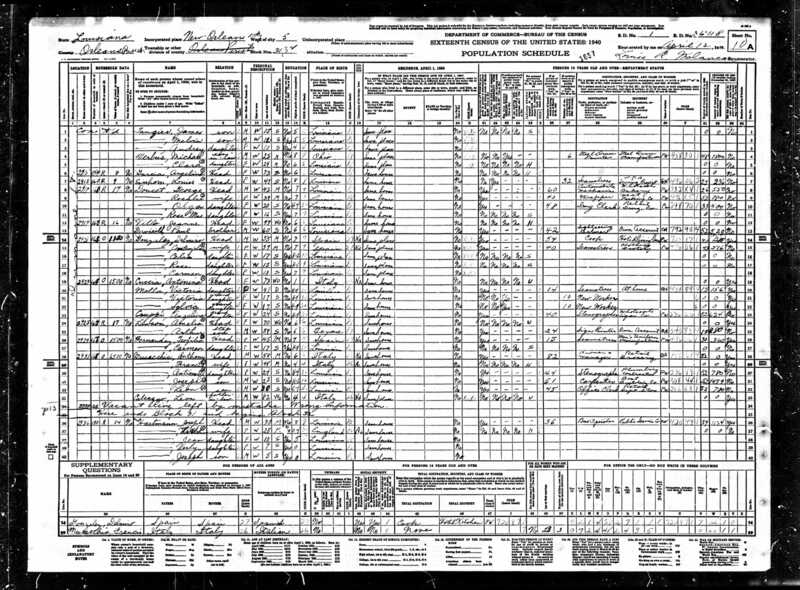 The census incorrectly lists his age as "3 2/12"; at the time of this census (January '20), Emmitt would have been about 17 months old. 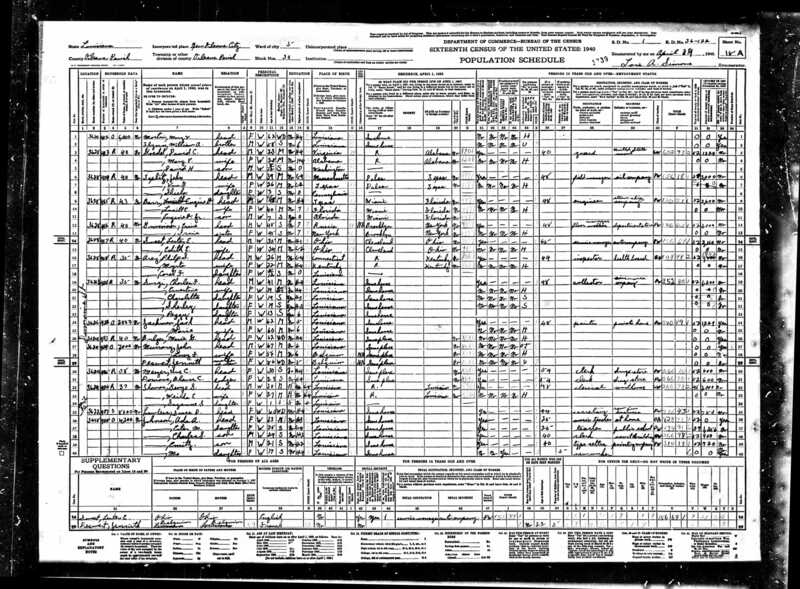 1930 Orleans Parish Census - Emmitt is 11 years old and living with his parents, Joseph Sr. and Ada, at 3618 Dumaine Street. 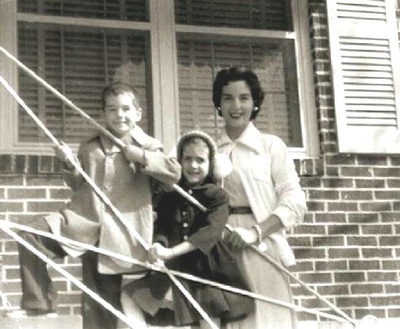 The household also includes his grandmother, Margaret Engler, and siblings Esther, Charles, Elizabeth, Robert and Margaret. 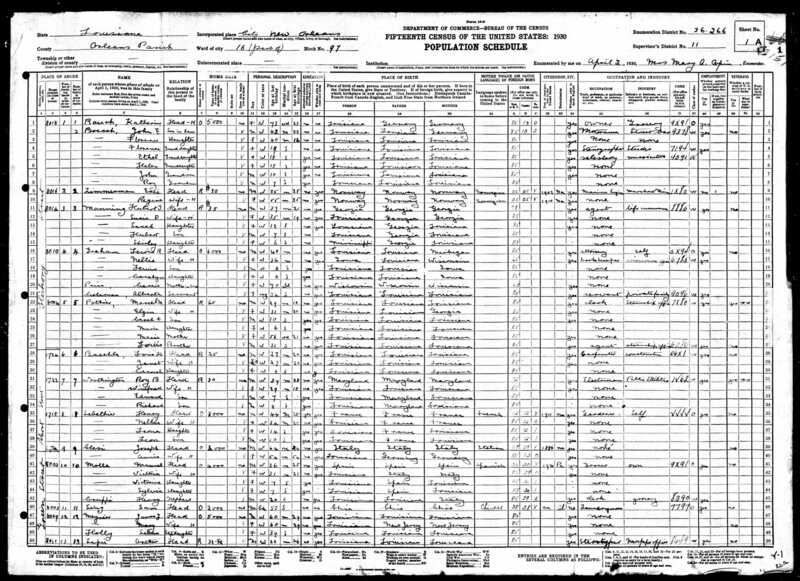 Of note in this census is the appearance of 50 year old Susie Lawless living next door, who most visitors to Ada's home over the years will recall as an elderly recluse well into the 1960's. 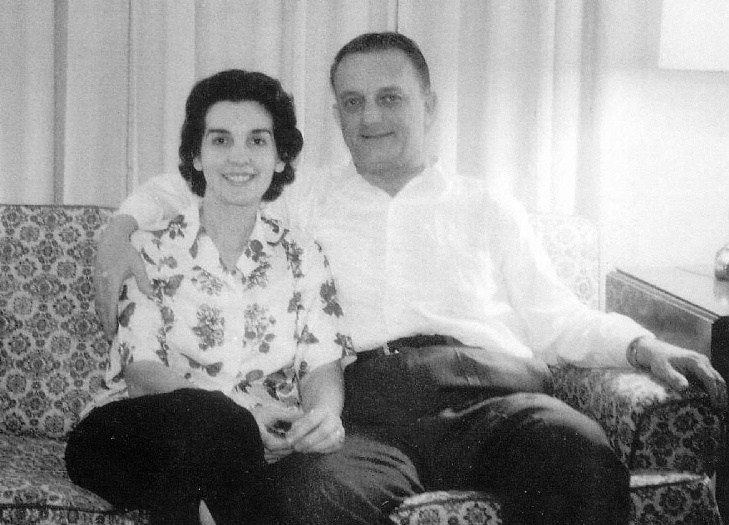 Further down the street at 3626 Dumaine are Charles and Ernestine Surgi, age 32 and 28 respectively; in the late 1960's, Emmitt and Vickie would rent the upstairs portion of the duplex from the Surgi's. 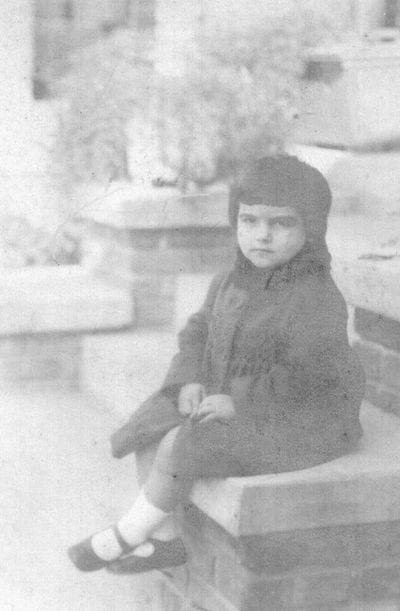 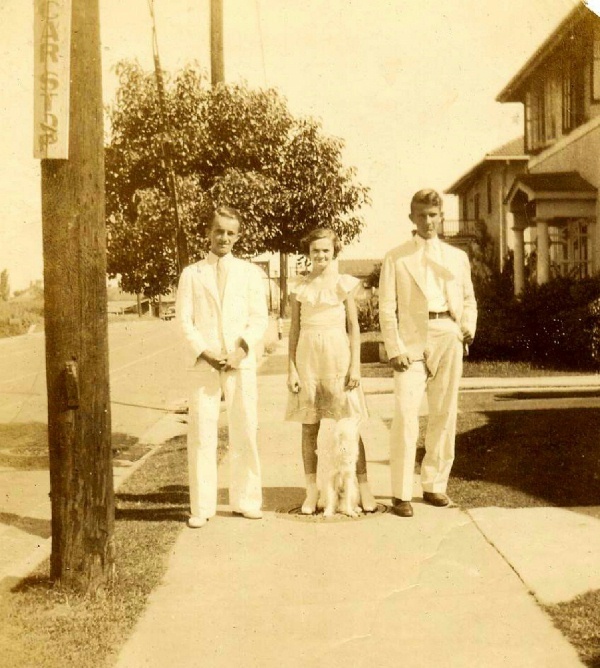 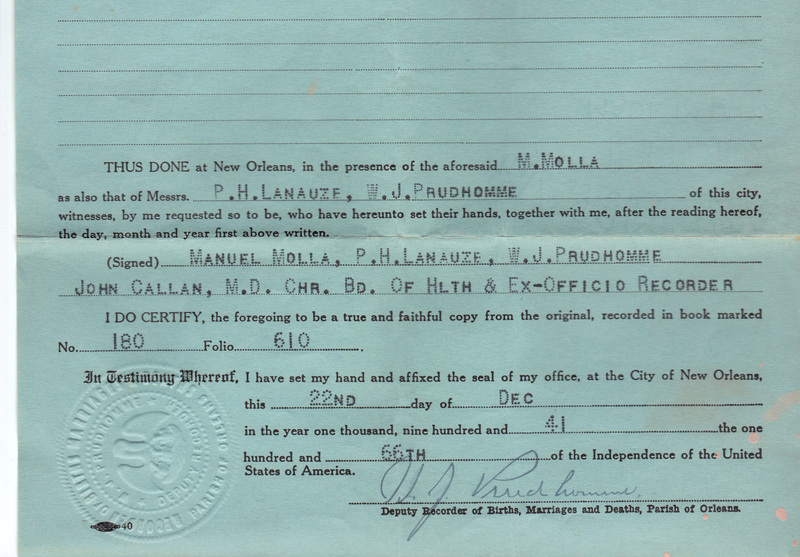 1930 Orleans Parish Census - Vickie is 7 years old and living with her parents Manuel and VIctoria, at 8003 Green Street. 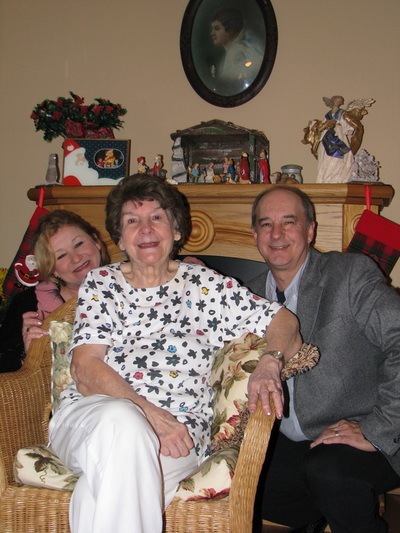 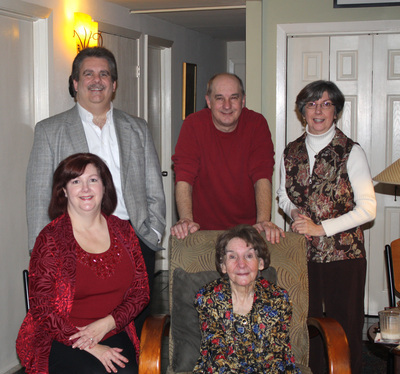 Also in the household are her sister Sylvia and her cousin Henry Cruppi. 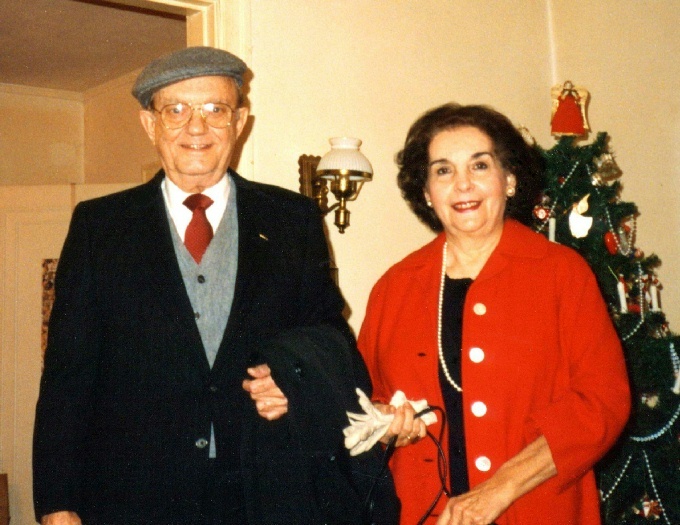 Manuel's occupation was listed as owning his own grocery store. 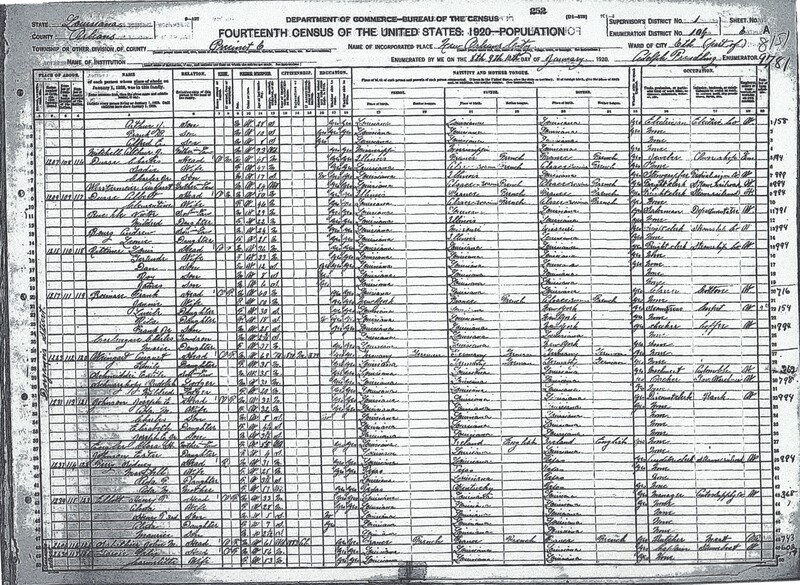 Vickie's name in this census is listed as "Victorine". 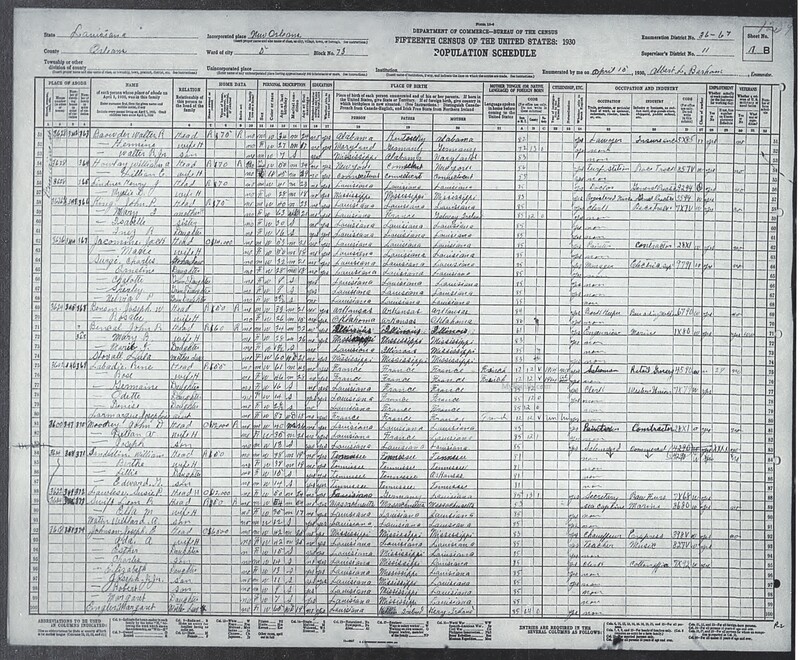 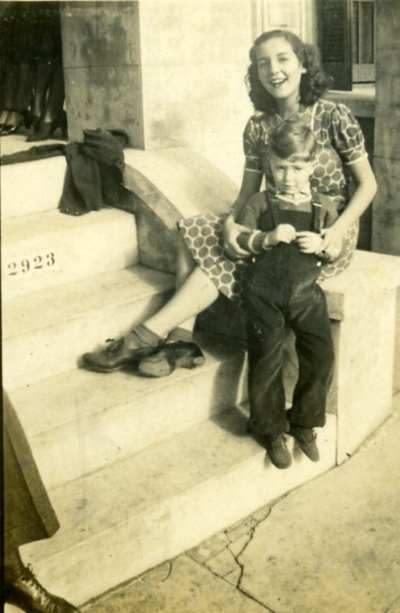 1940 Orleans Parish Census - Emmitt is 21 years old and living with his mother Ada at 3618 Dumaine Street. 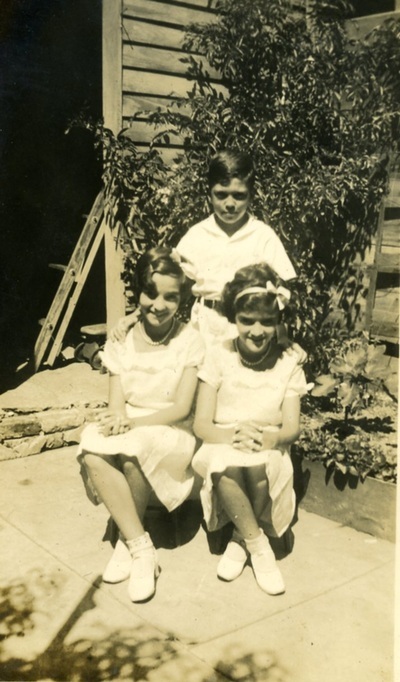 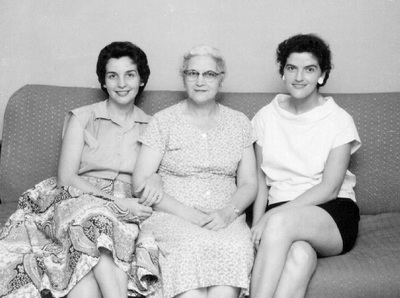 In the household are his grandmother, Margaret Engler, and his siblings Esther, Charles, and Margie. 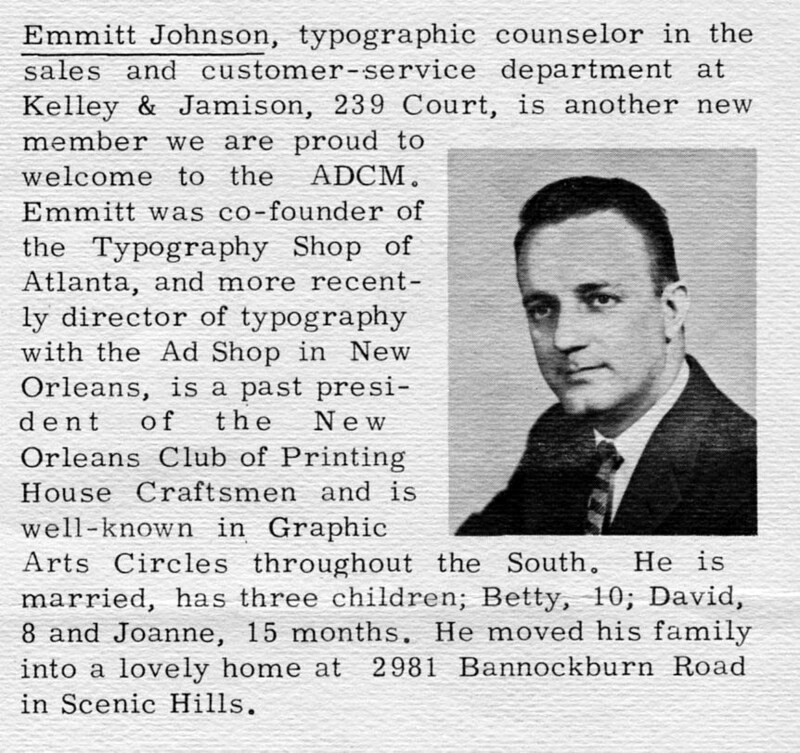 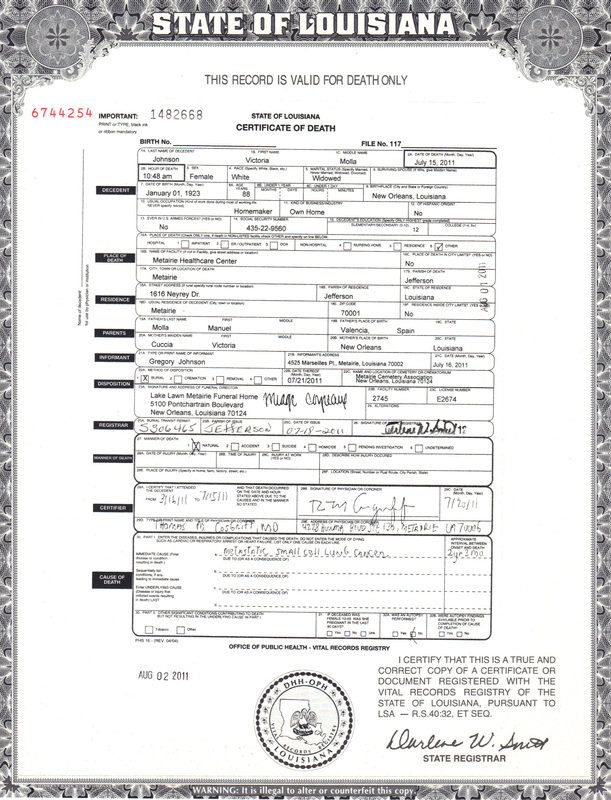 Emmitt's profession is a typesetter with a printing company. 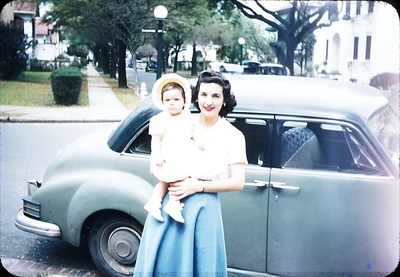 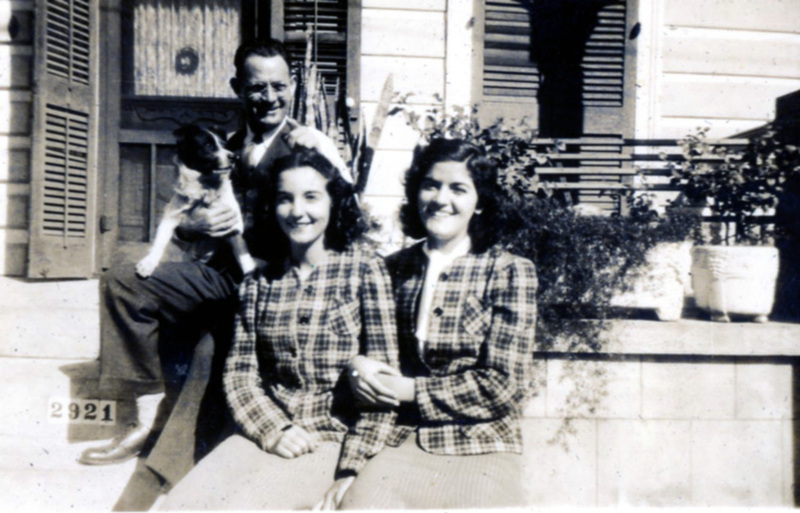 1940 Orleans Parish Census - Vickie is 17 years old and living at 2923 Dumaine Street with her grandmother Antonina, who is listed as the head of the household, and her mother Victoria. 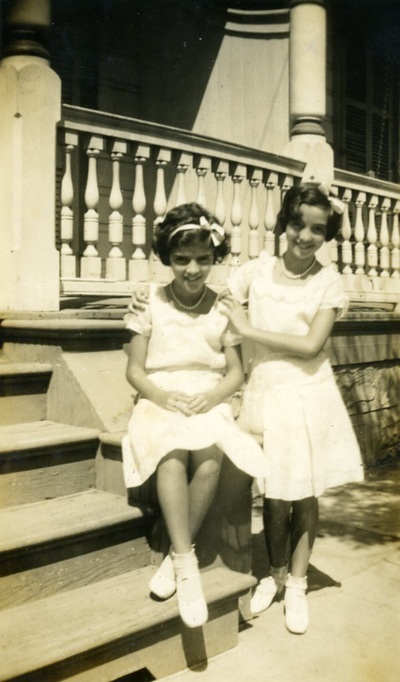 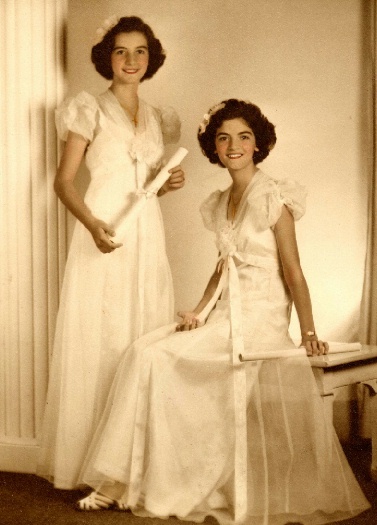 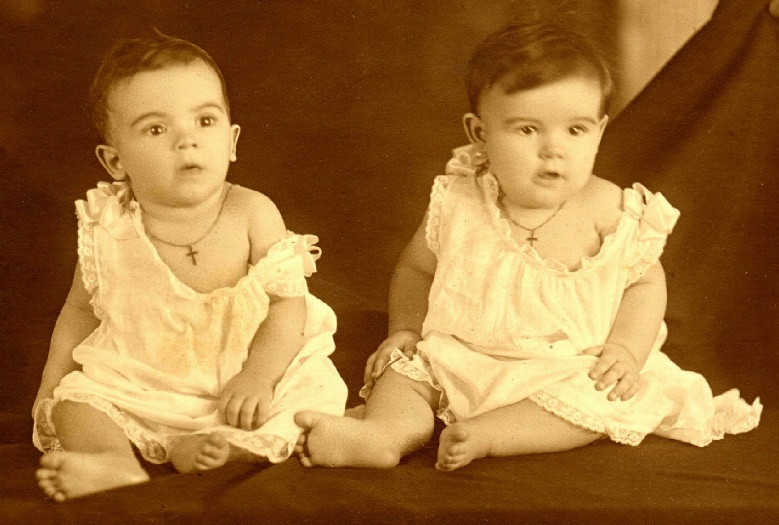 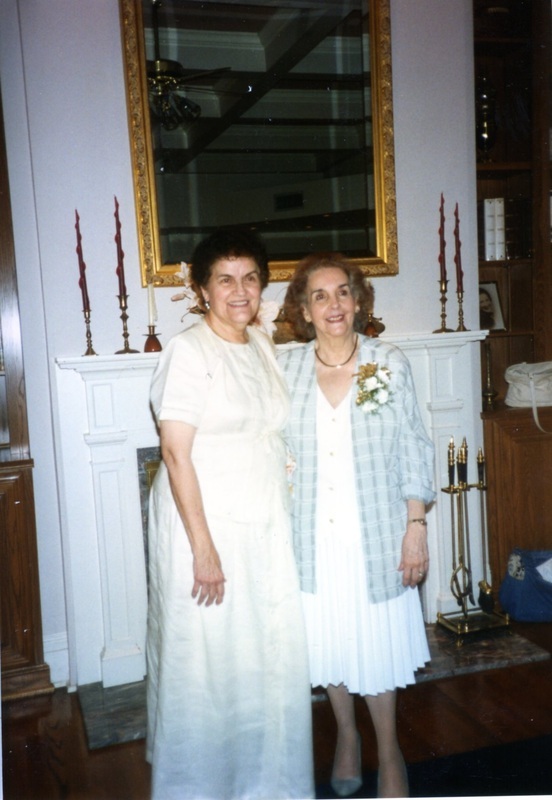 Also in the household are her sister Sylvia and her cousin Angelina Cruppi. Vickie with Irvin "Ernie" Strenge, Jr.
Camp Croft, South Carolina - January 1942. 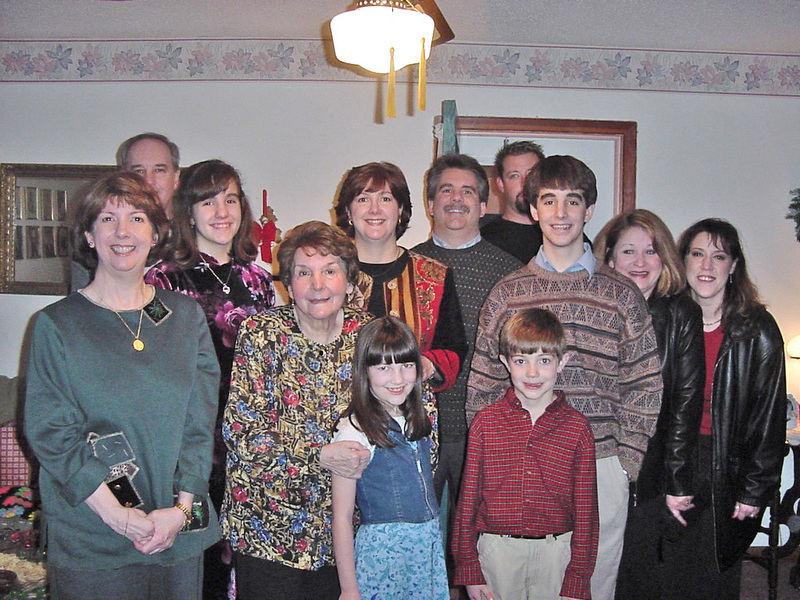 Emmitt is circled. 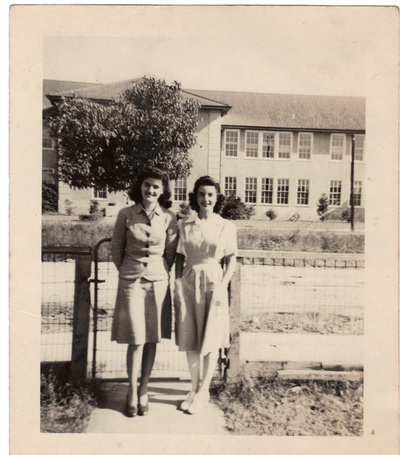 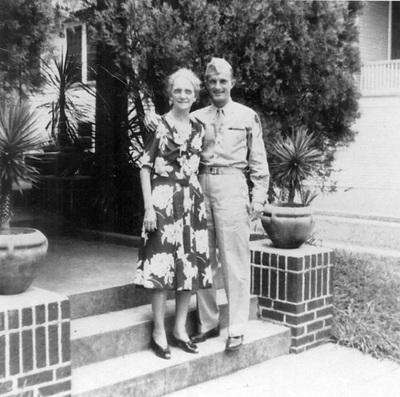 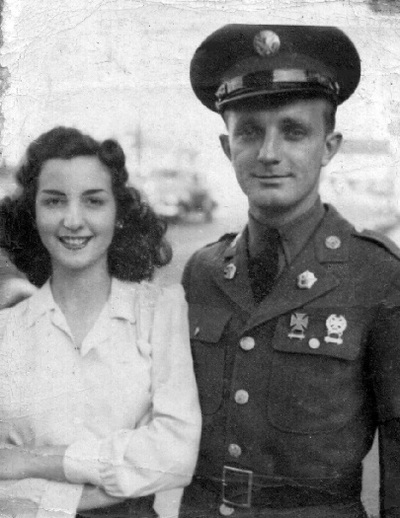 Vickie and Emmitt - taken on Emmitt's furlough before being shipped overseas during WWII. 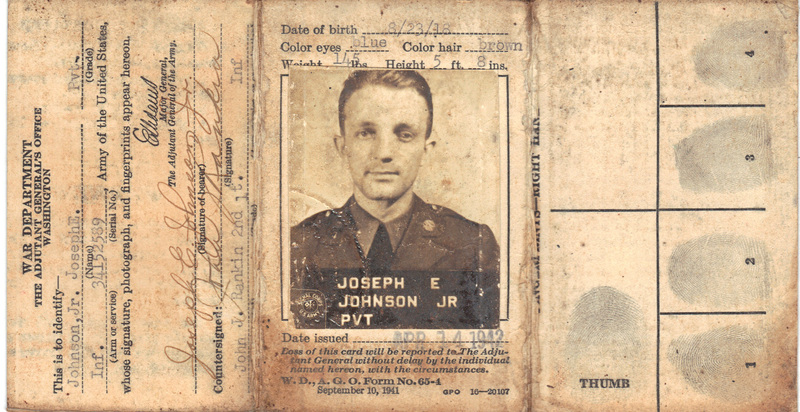 Private Joseph E. Johnson, Jr.
One of many V-Mails sent to then girlfriend, Vickie. 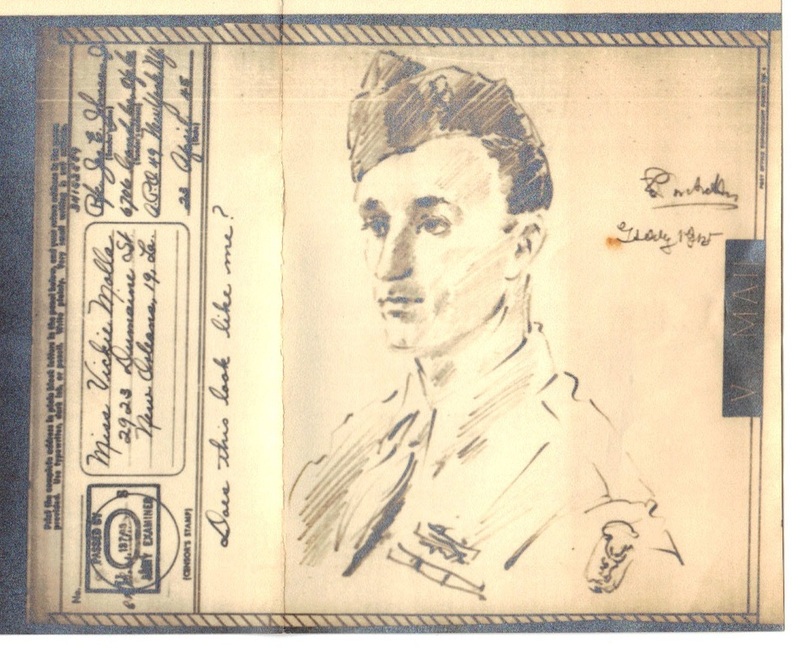 The drawing was by one of Emmitt's Army buddies. 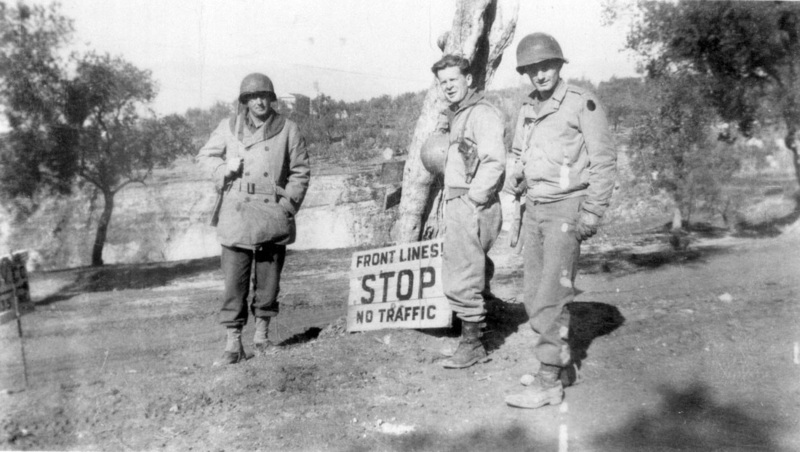 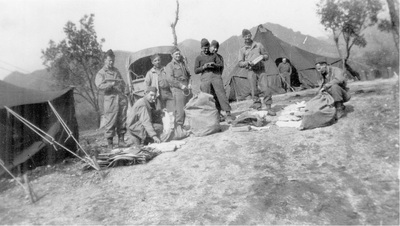 Emmitt (far right) - the back of the photograph indicates this was taken in Monte Cassino where Emmitt's unit took part in the Battle of Monte Cassino. 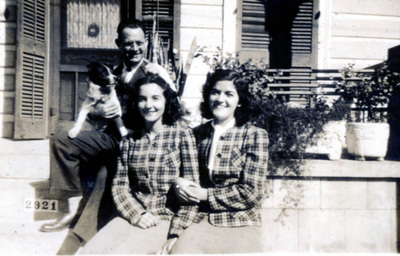 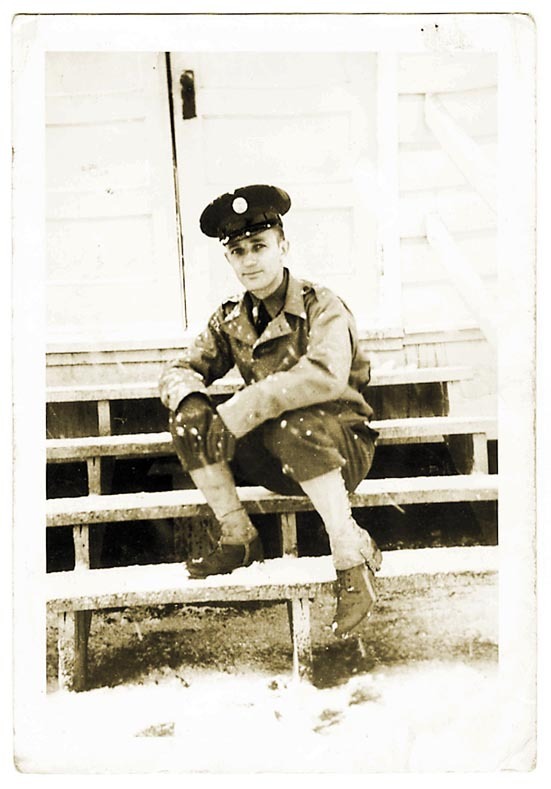 Wartime photograph that Emmitt sent to Vickie. 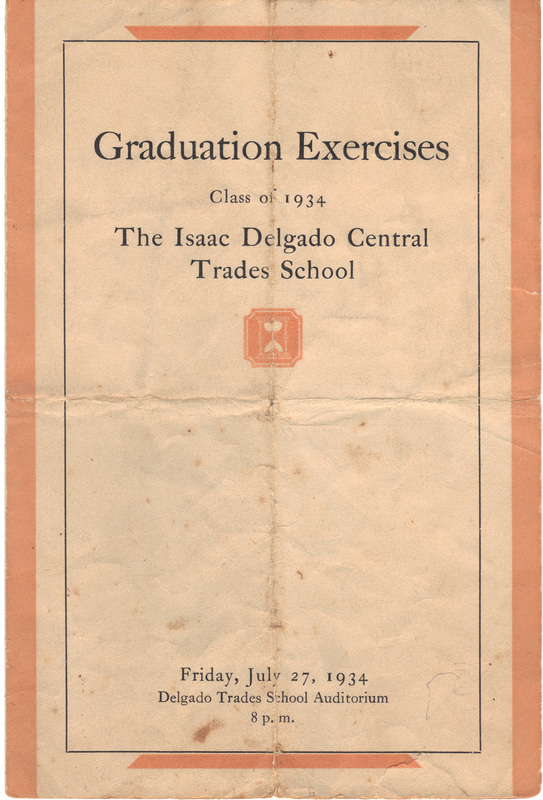 The back reads "Mail Call, two days before X-mas last year. 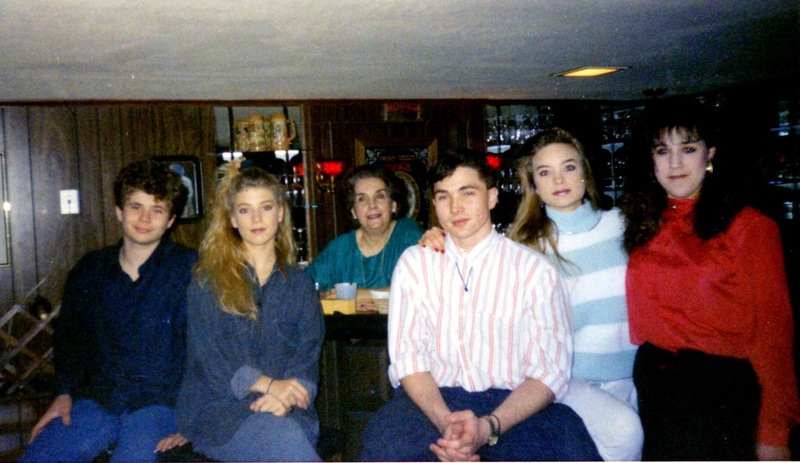 That's me in the middle with the sweater on reading a V-mail that I had just received from you." 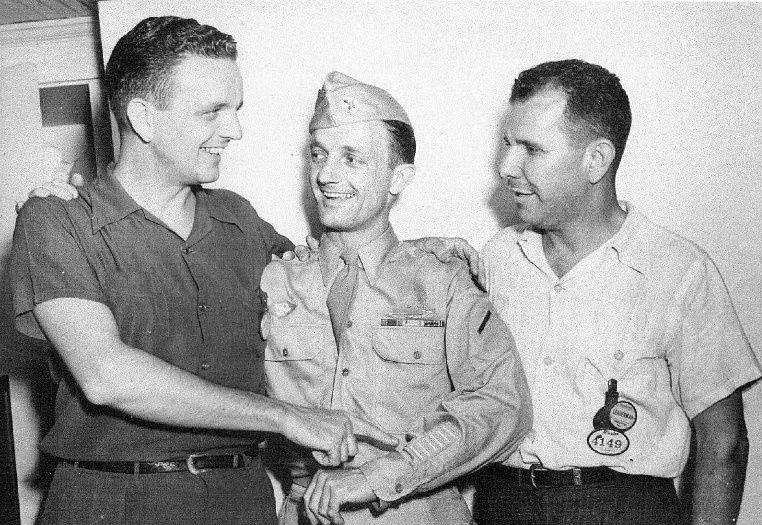 Emmitt (center) with brother Charlie (left) and brother-in-law George Dureau (right). 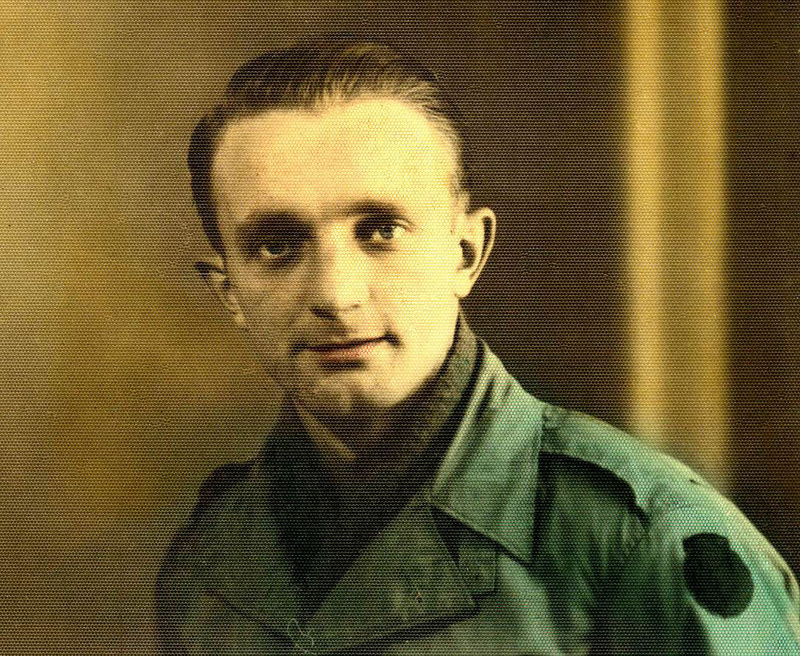 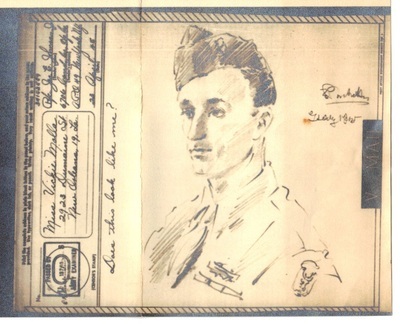 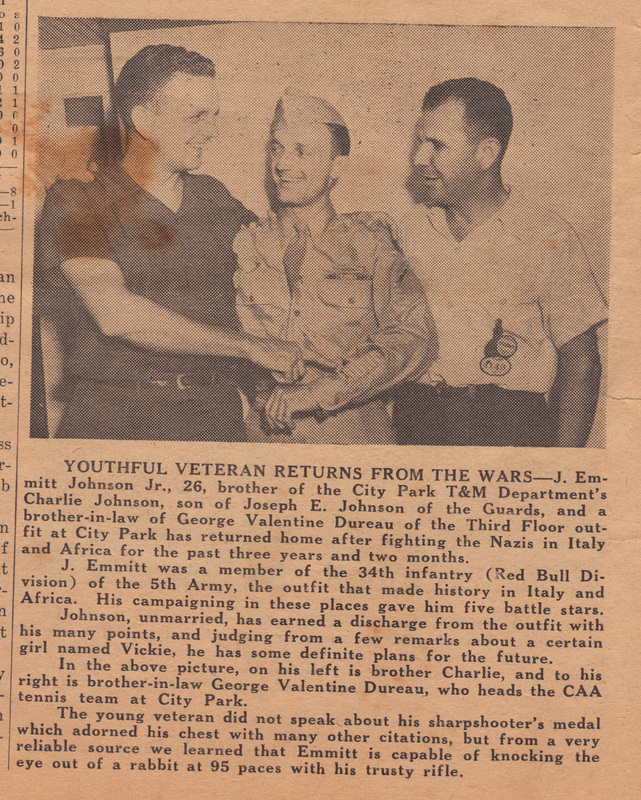 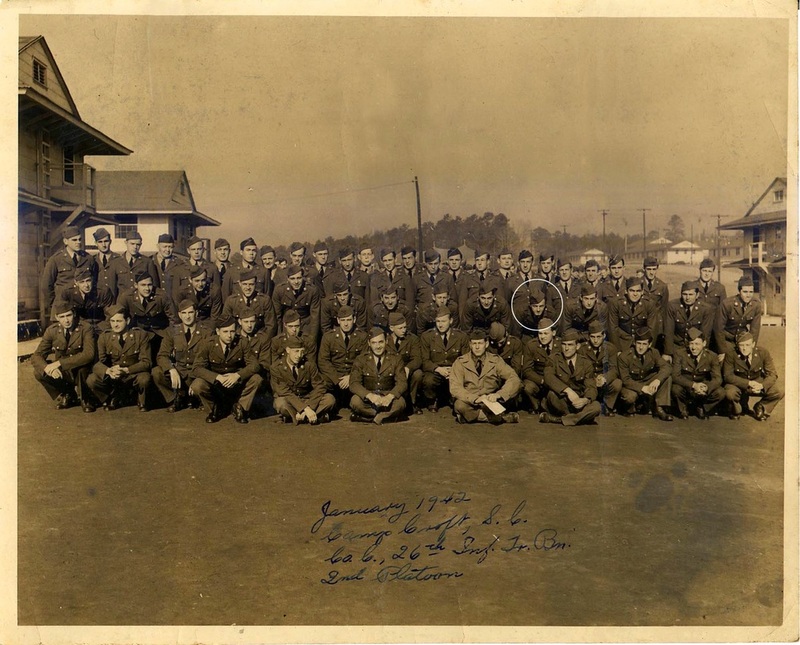 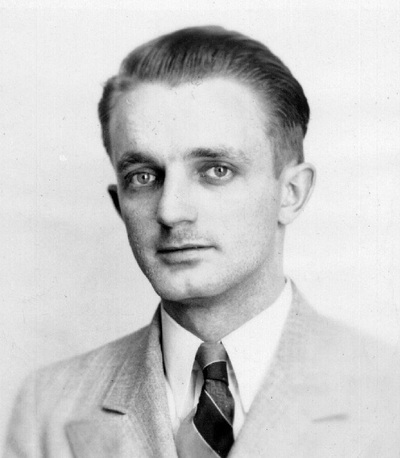 This picture appeared in the local newspaper upon his return from WWII. 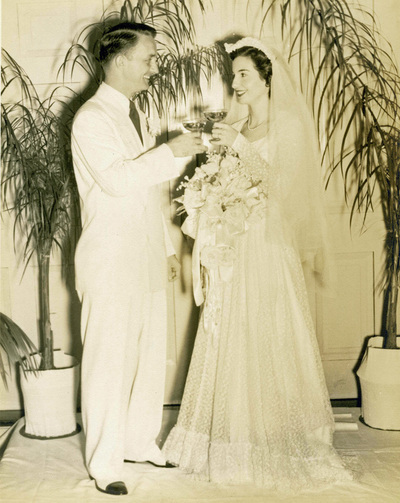 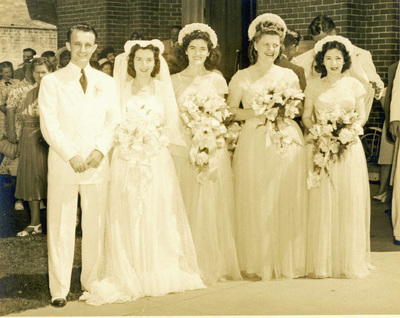 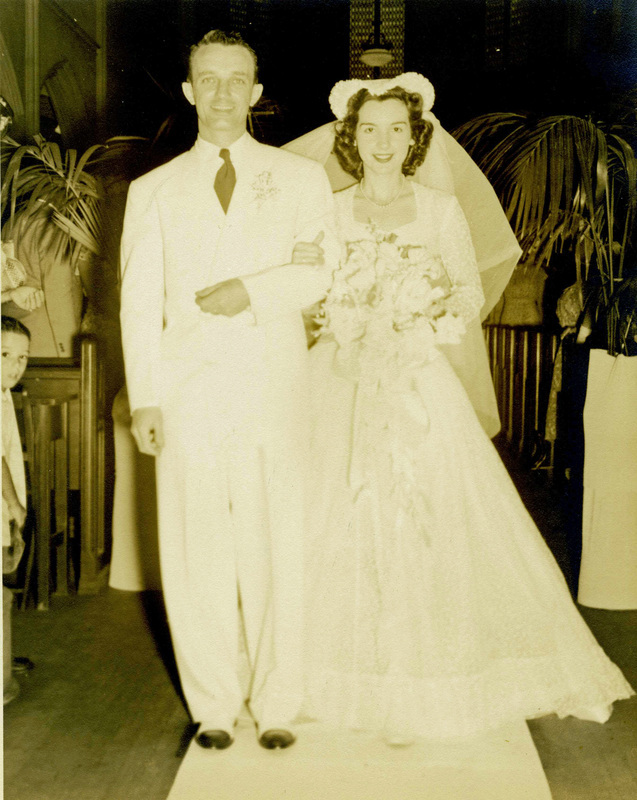 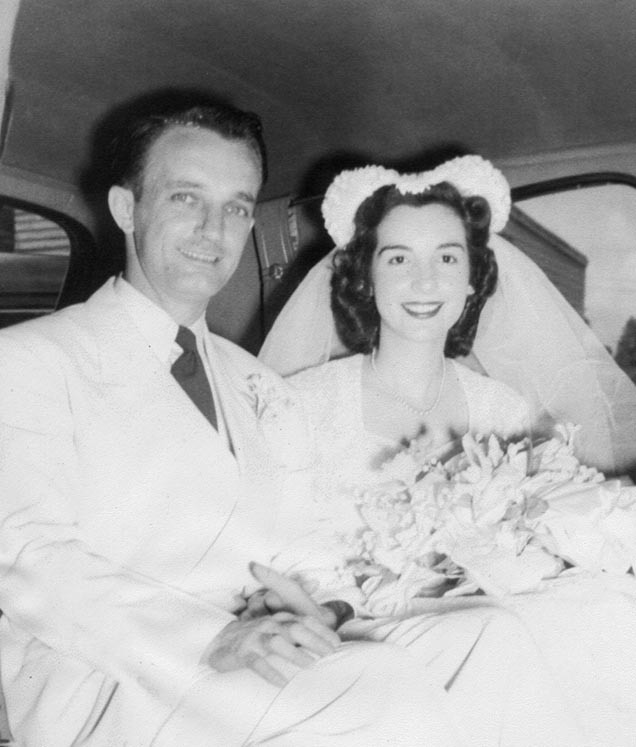 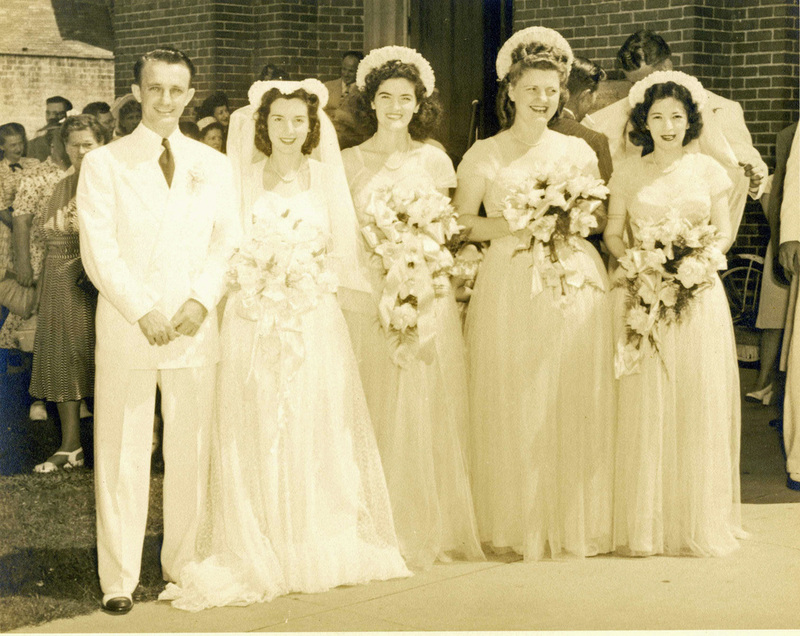 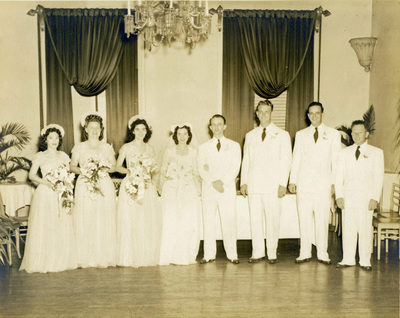 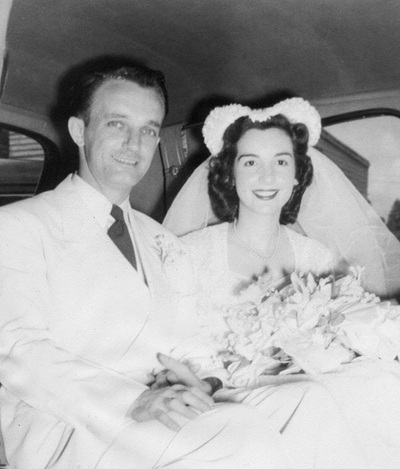 Emmitt & Vickie's wedding - June 28, 1947. 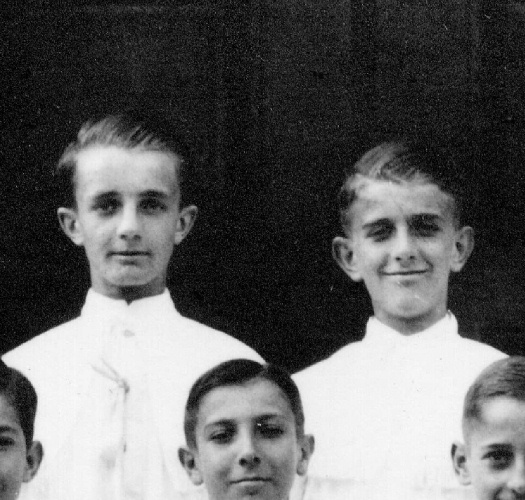 In the background are brother-in-law George Dureau (left) and brother Charlie (right). 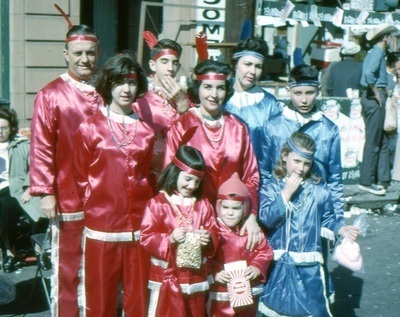 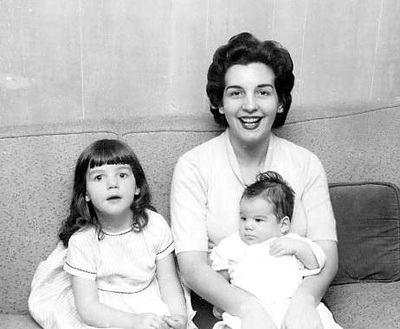 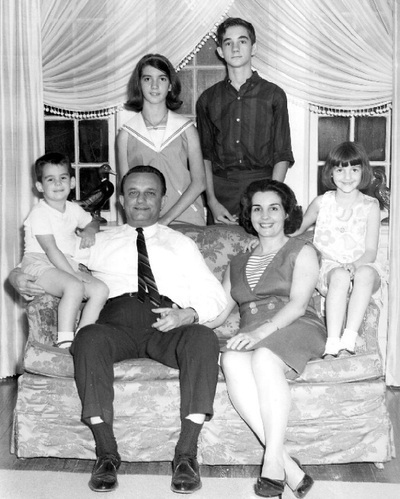 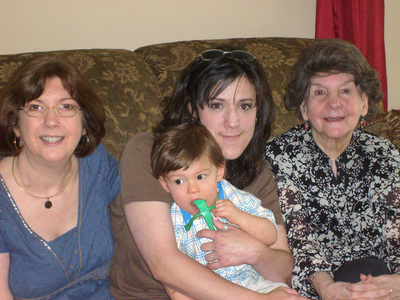 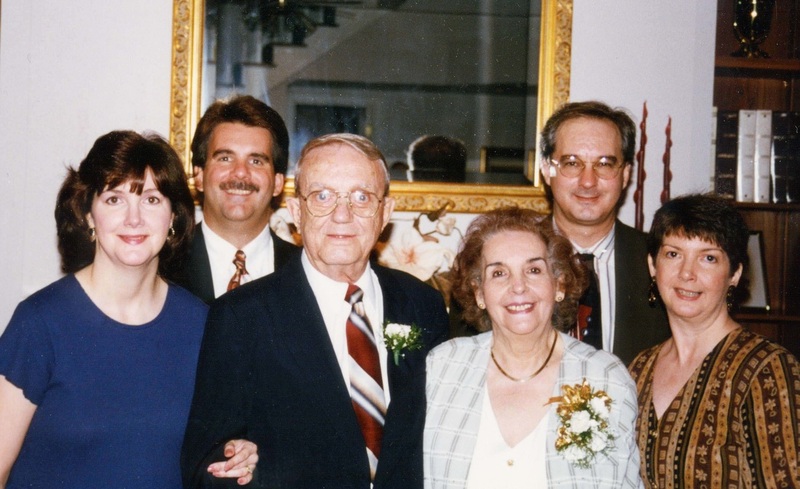 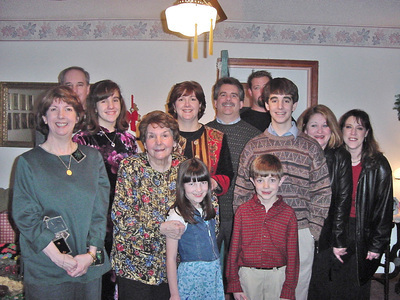 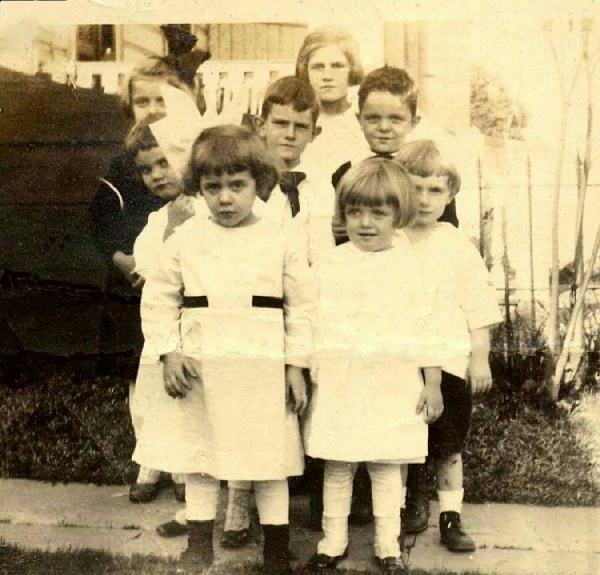 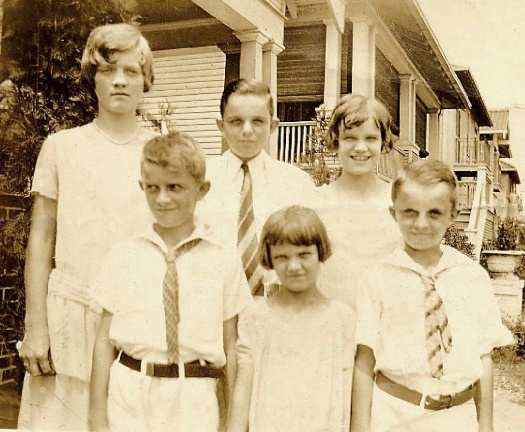 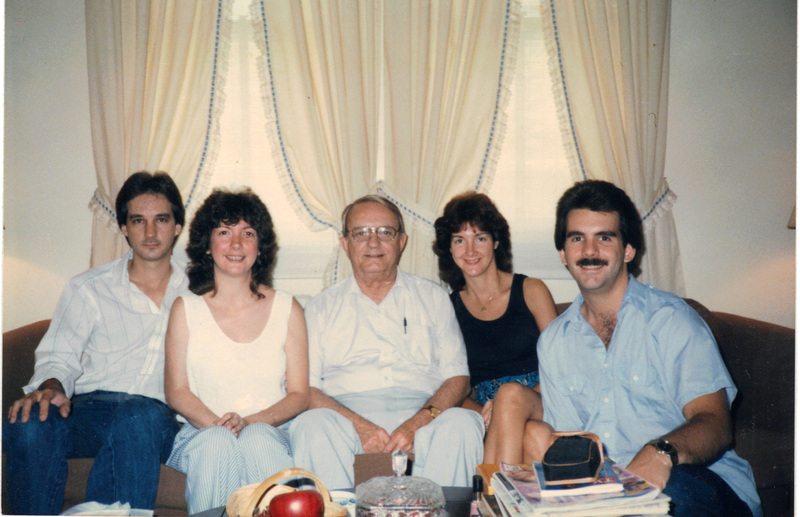 Emmitt and Vickie with children (l to r): Greg, Betty, David and Joanne. 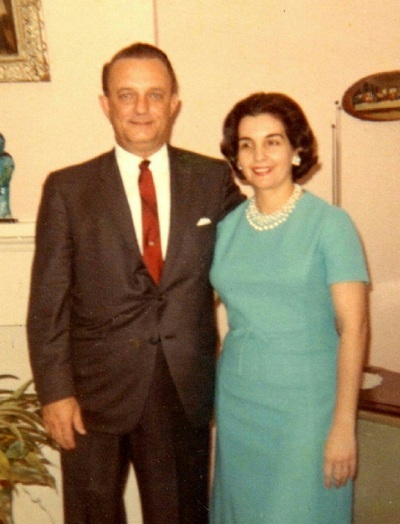 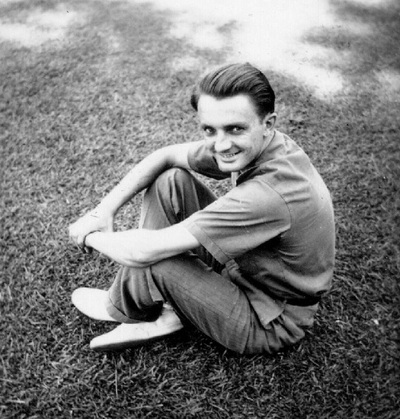 Taken at the home of Bob and Alice Johnson in 1964. 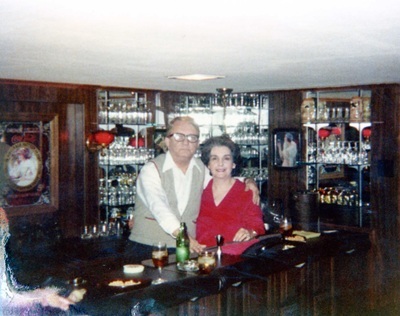 Emmitt and Vickie - behind the bar that Emmitt built for their Taft Place home. 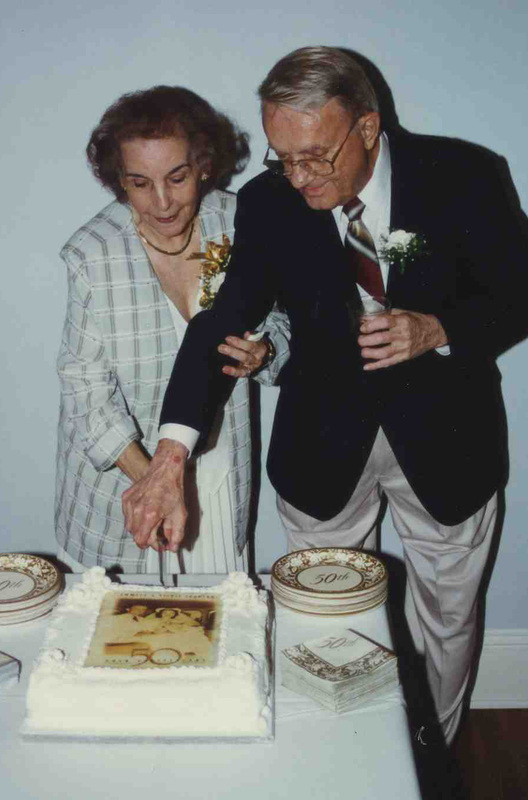 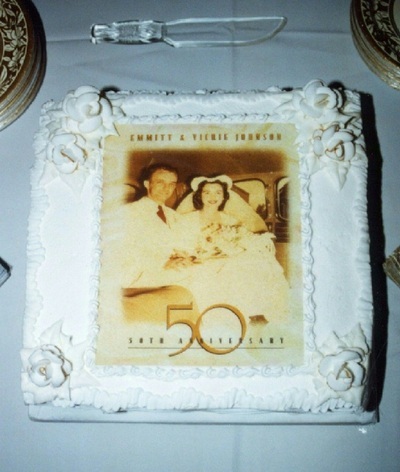 Emmitt & Vickie's 50th Anniversary Celebration (1997). 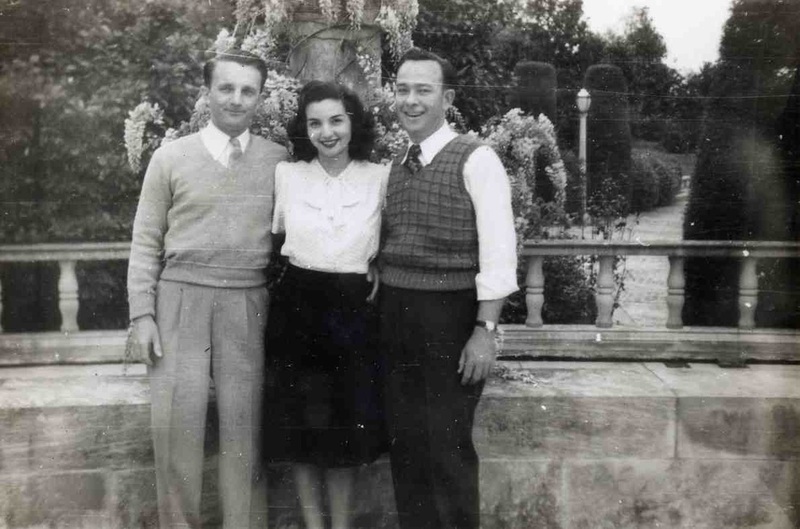 They are flanked by Bob Johnson and Sylvia Molla Redmond. 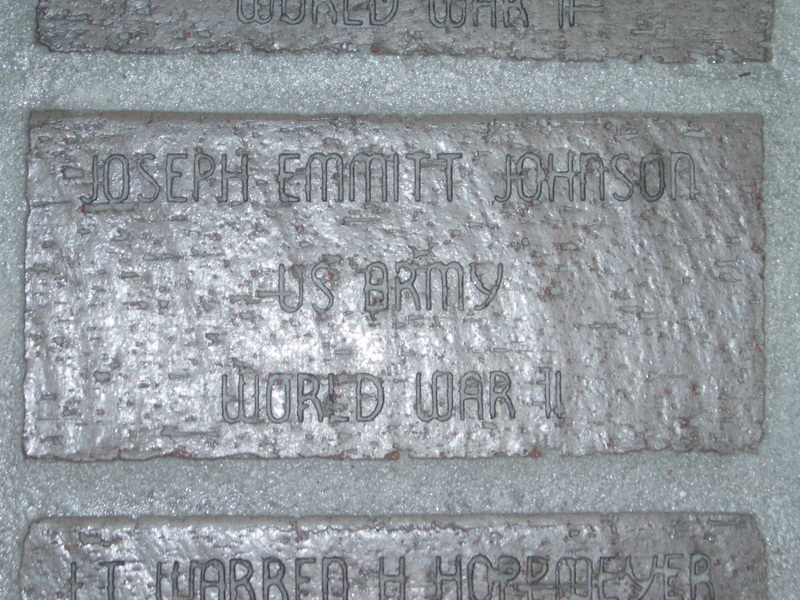 The WWII Museum brick purchased for Emmitt.